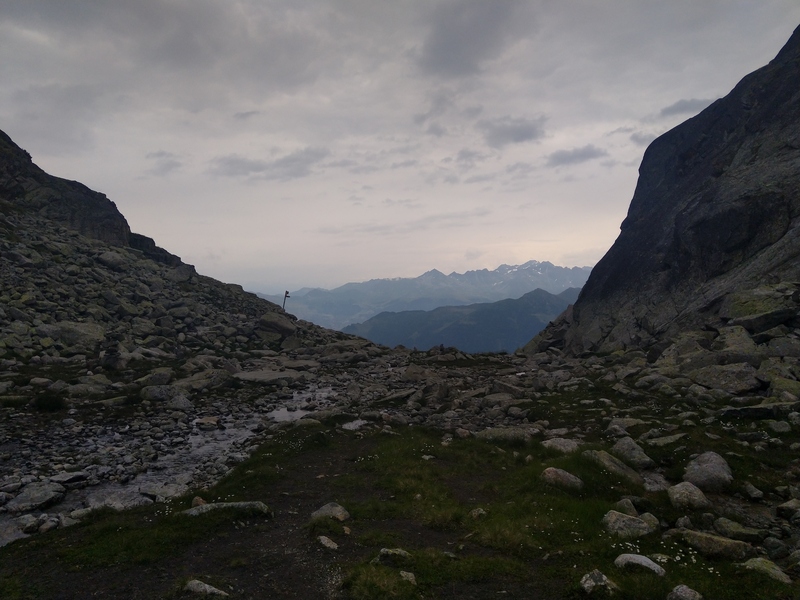 My backpack was weighting 14 Kg including 2L of water and a ~2Kg computer for potential work stuff (that I finally haven't used!) 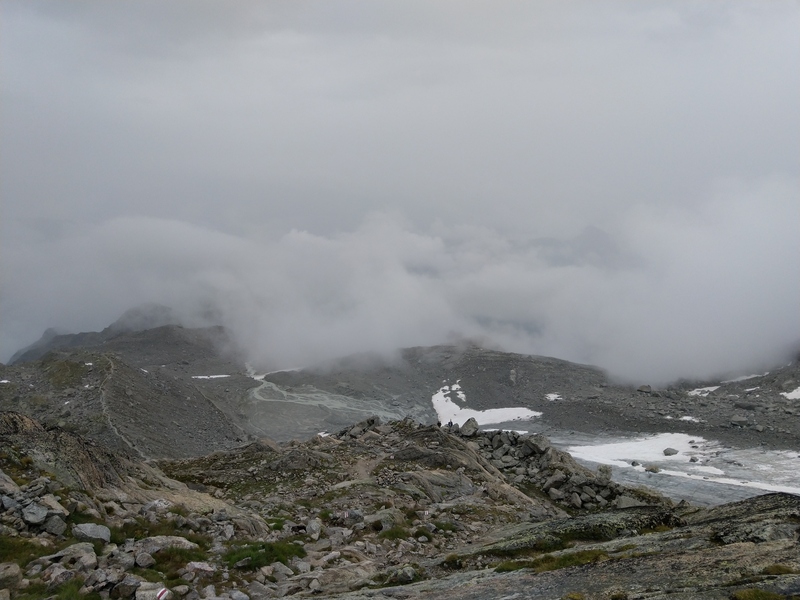 - it's entirely feasible to leave with a 35L backpack. 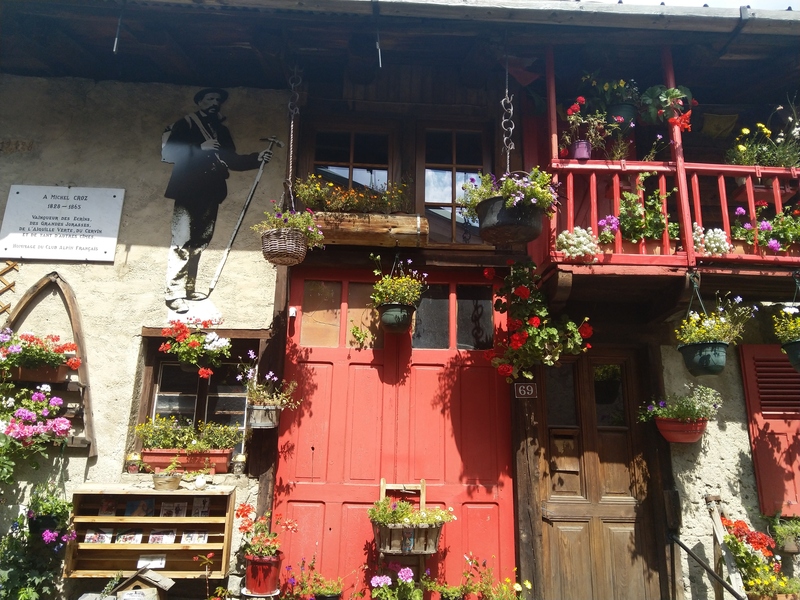 Gîte du Moulin (FR) - Les Coutamines Montjoie (FR). 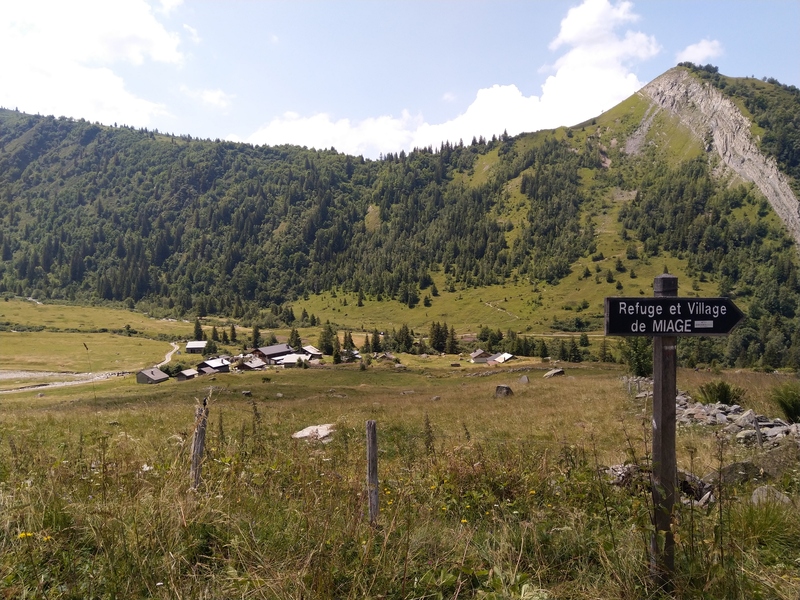 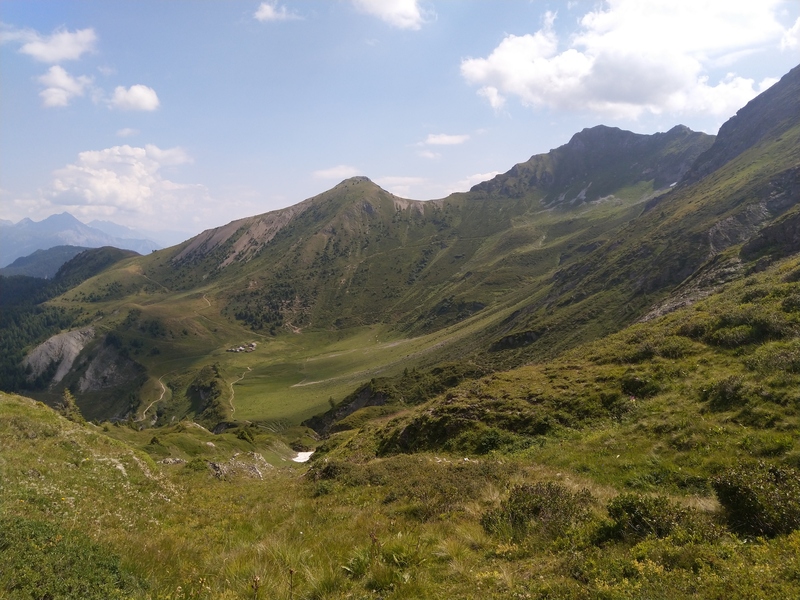 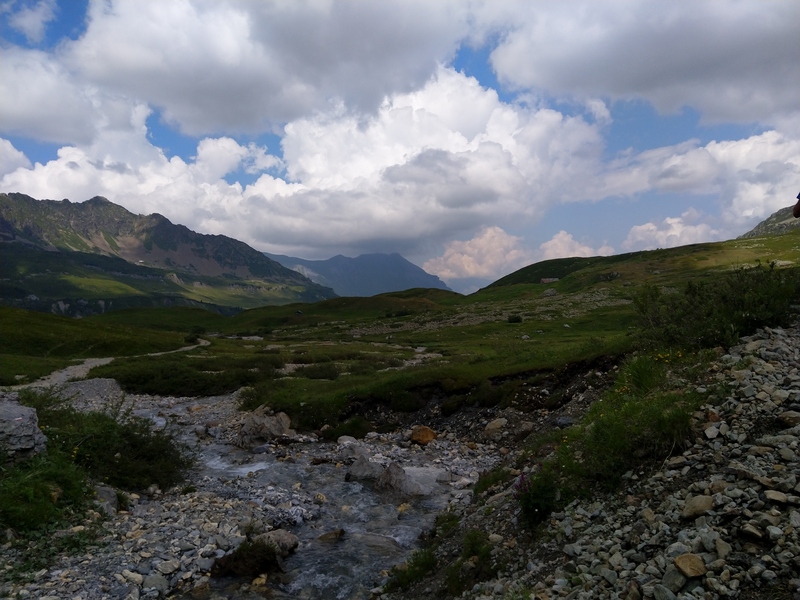 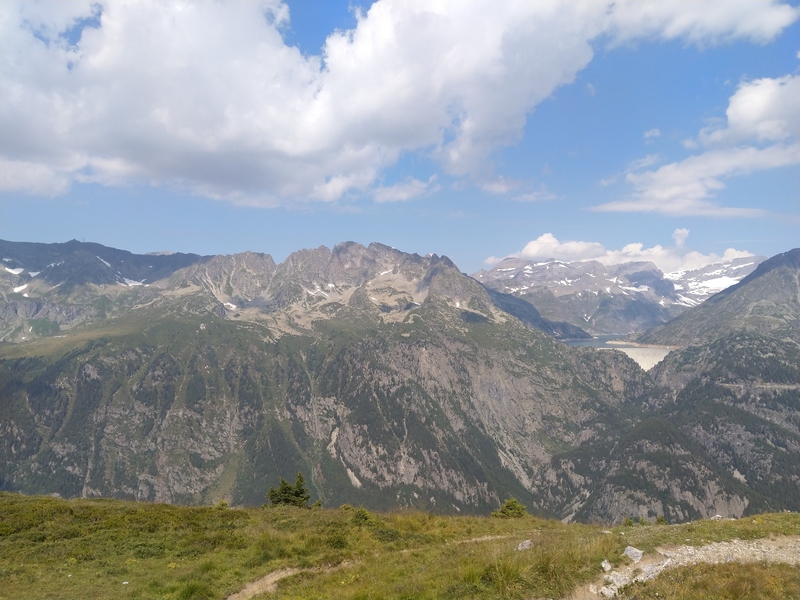 The weather was great on this first day walking to the Col du Tricot, the Refuge de Miage and Le Truc up to Les Coutamines. 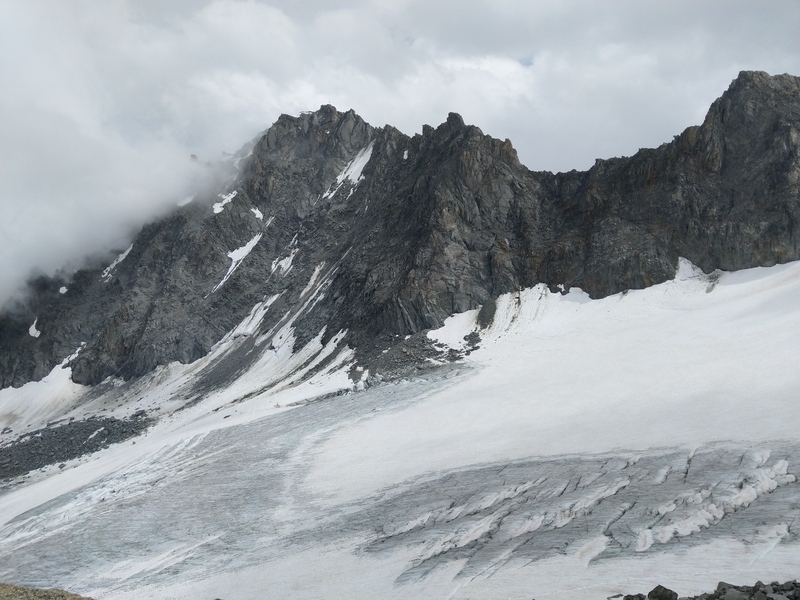 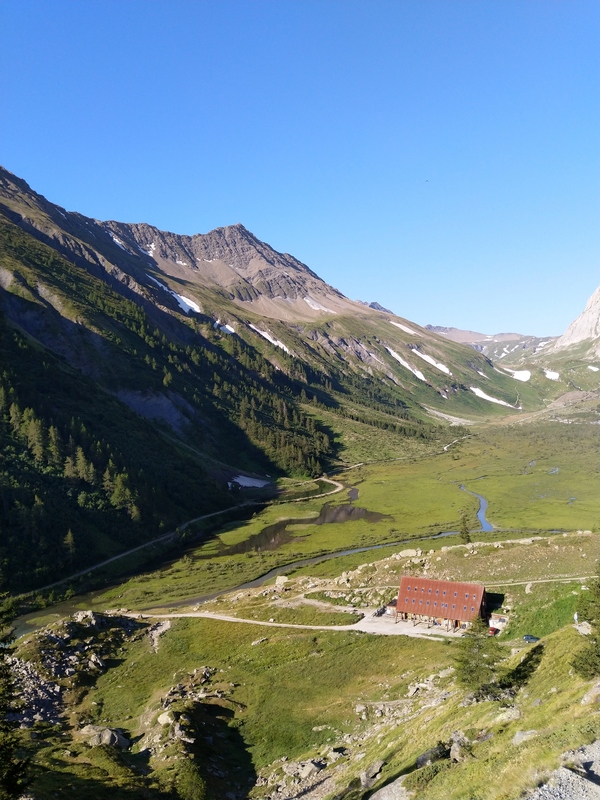 The Refuge du Goûter was visible from the Col du Tricot while an helicopter was attempting a rescue or loading resources. 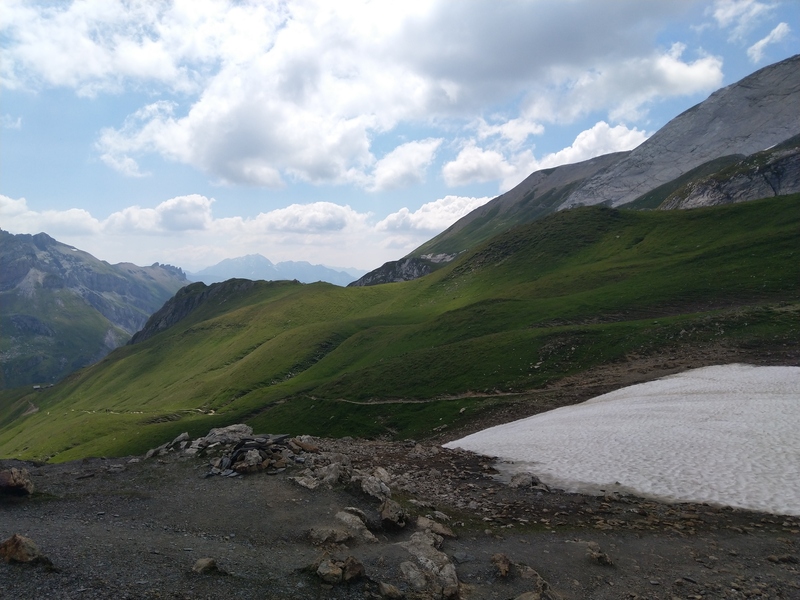 Les Coutamines Montjoie (FR) - Refuge du Col de la Croix du Bonhomme (FR). 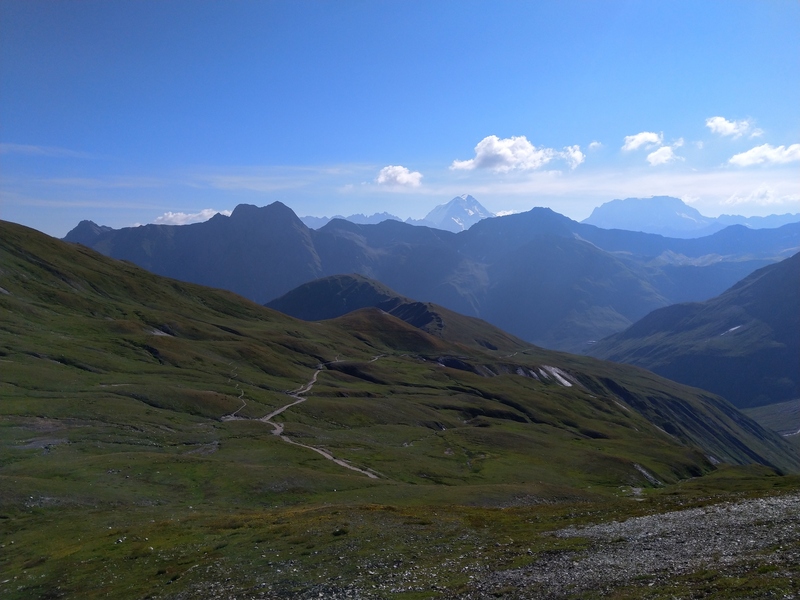 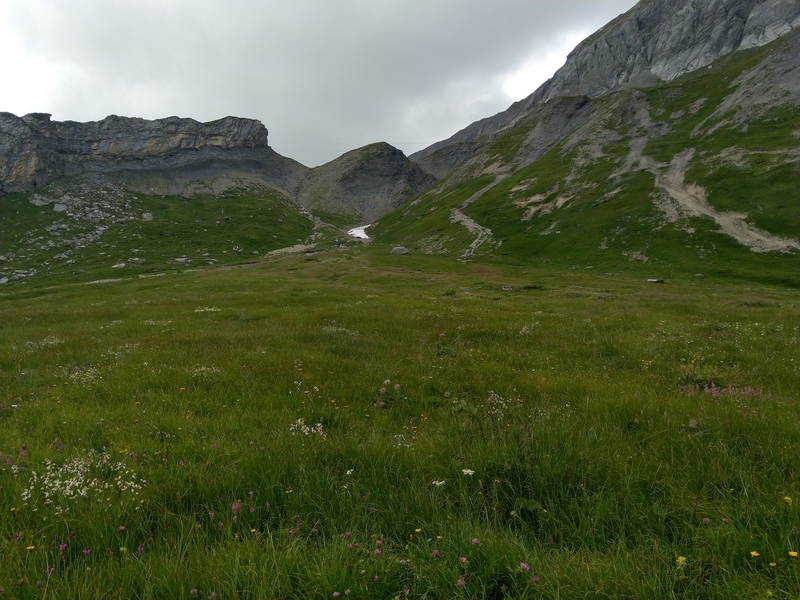 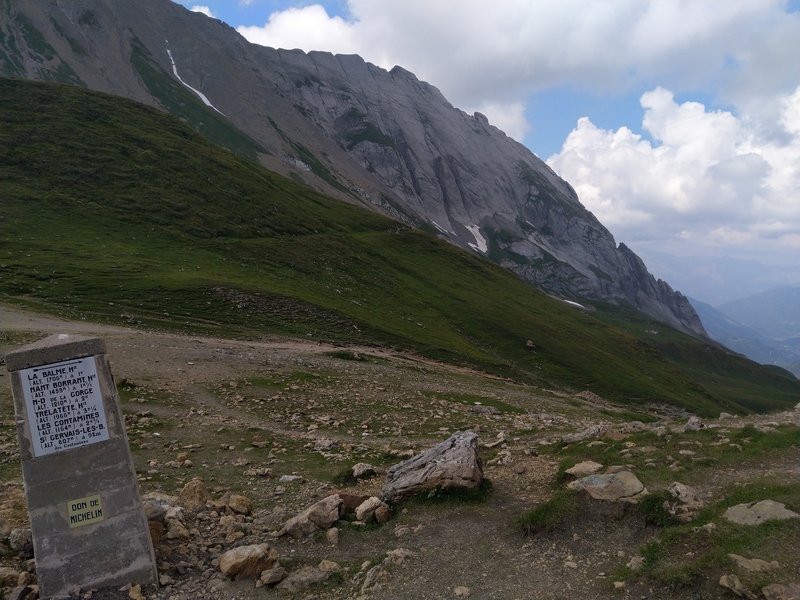 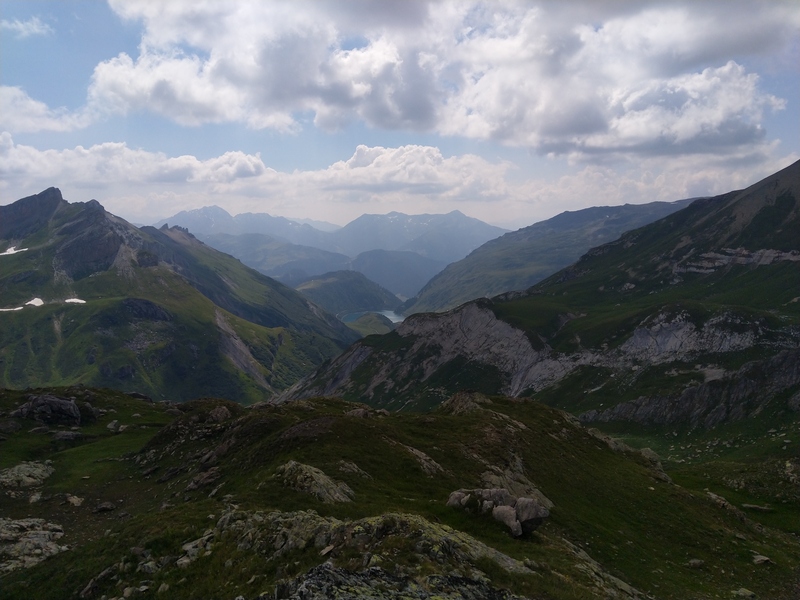 We reached the southernmost point of the TMB at the Refuge du Col de la Croix du Bonhomme. 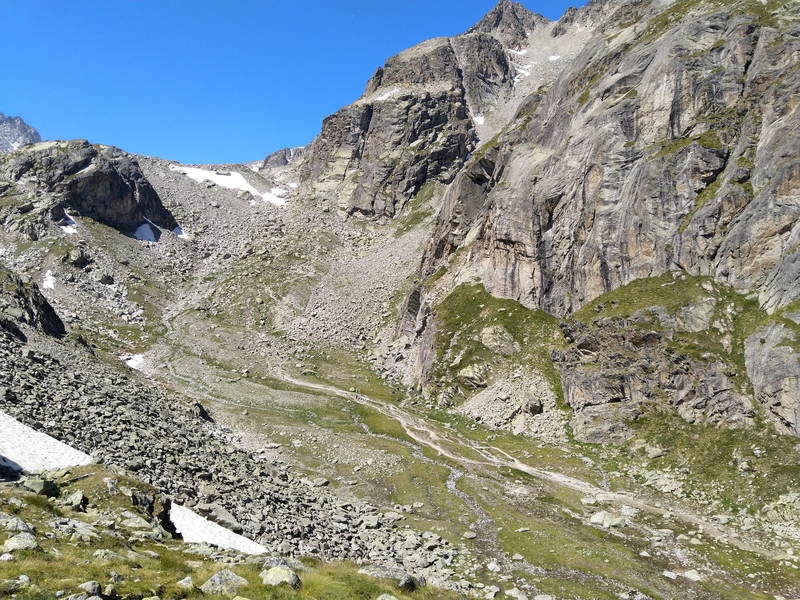 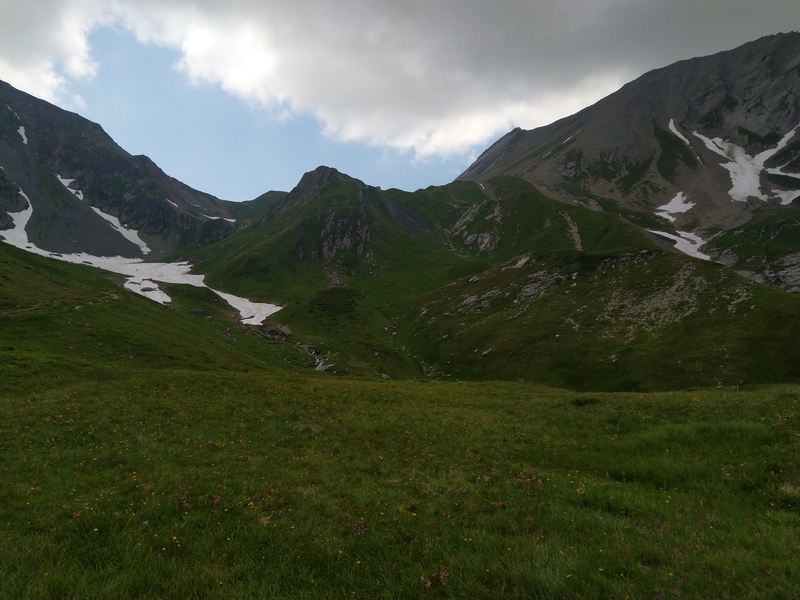 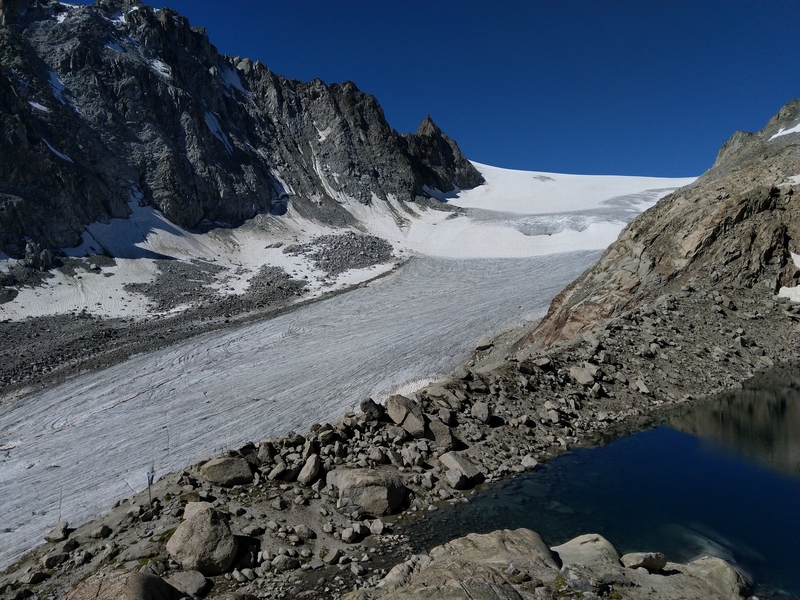 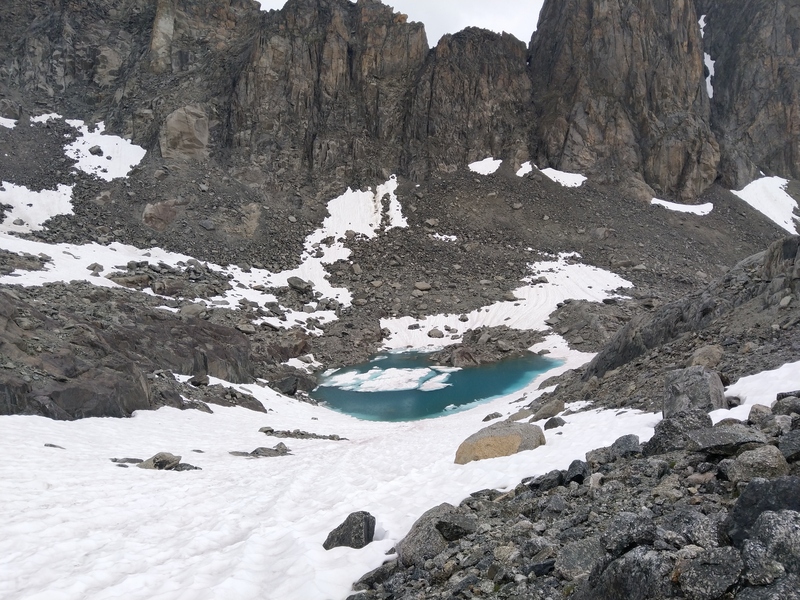 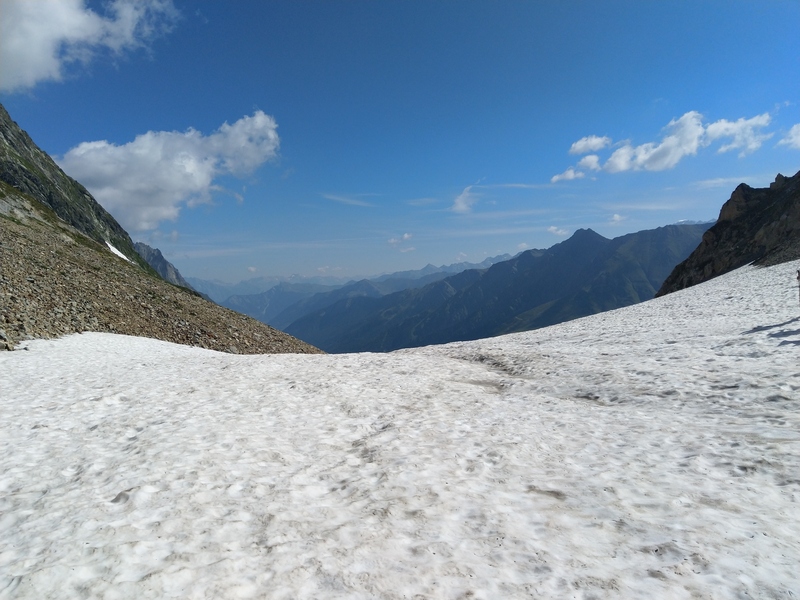 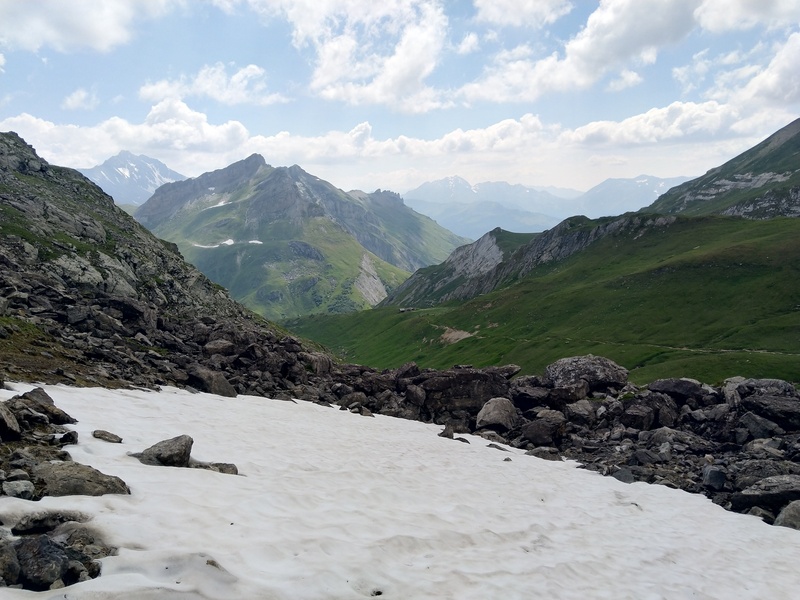 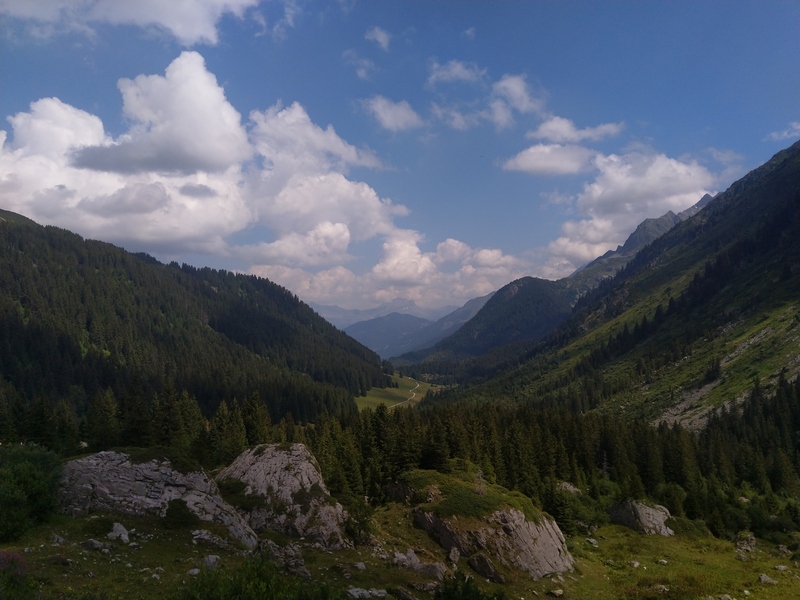 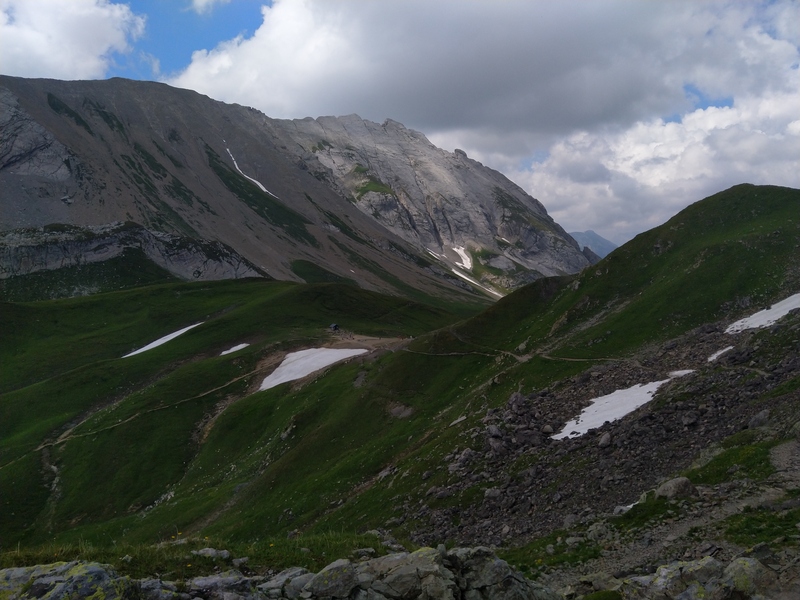 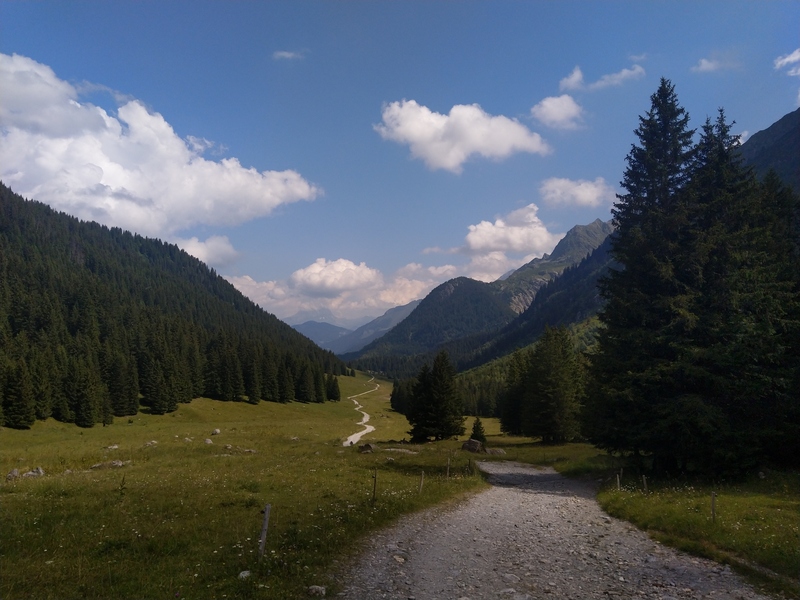 The weather was still great and hot, although some snowfields were still there since this snowy winter. 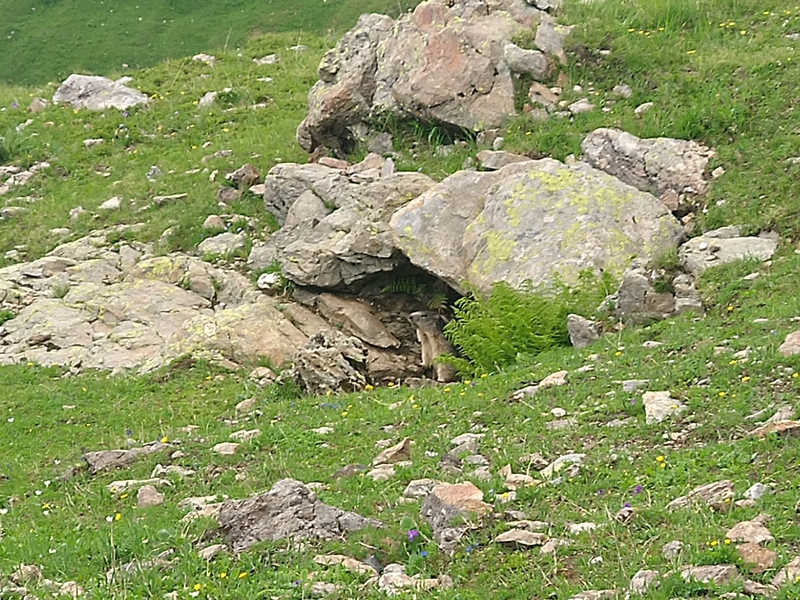 Several ibex came close to the refuge at sunset to lick remaining salt blocks which was an amazing scene to look at. 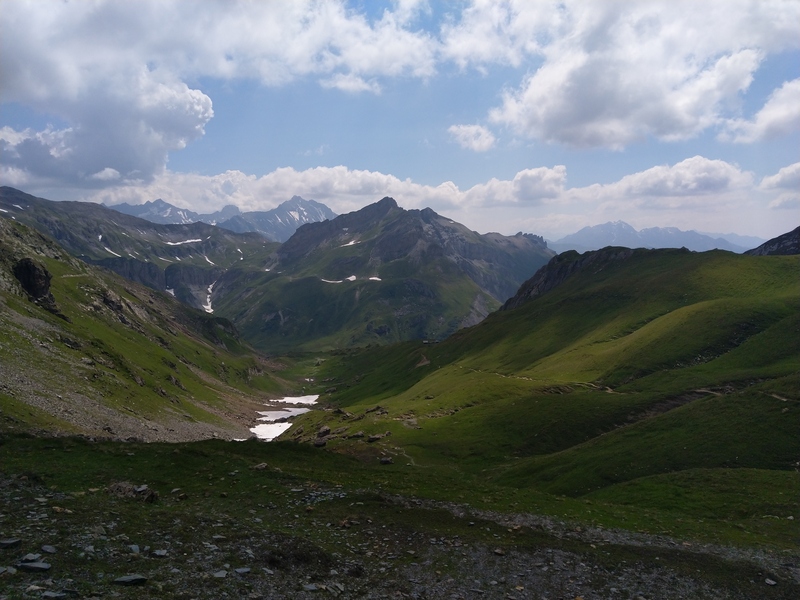 Refuge du Col de la Croix du Bonhomme (FR) - Refuge Combal (IT). 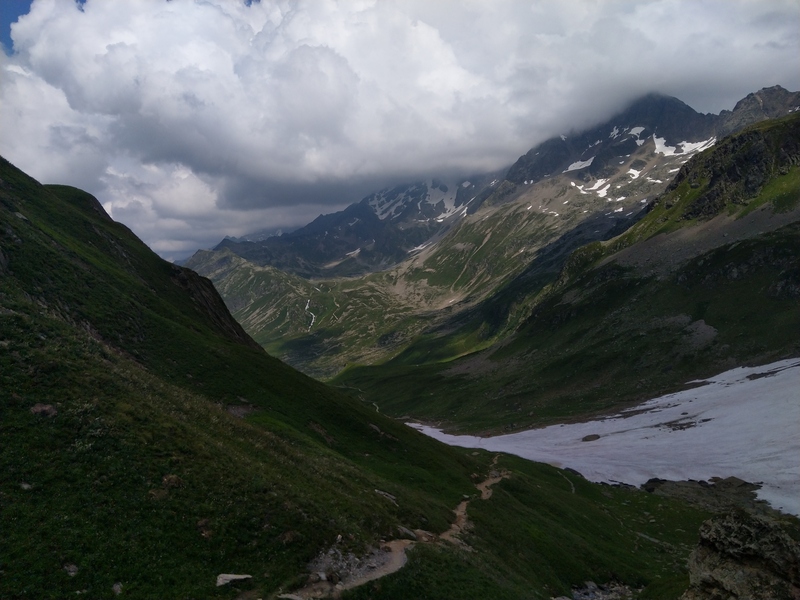 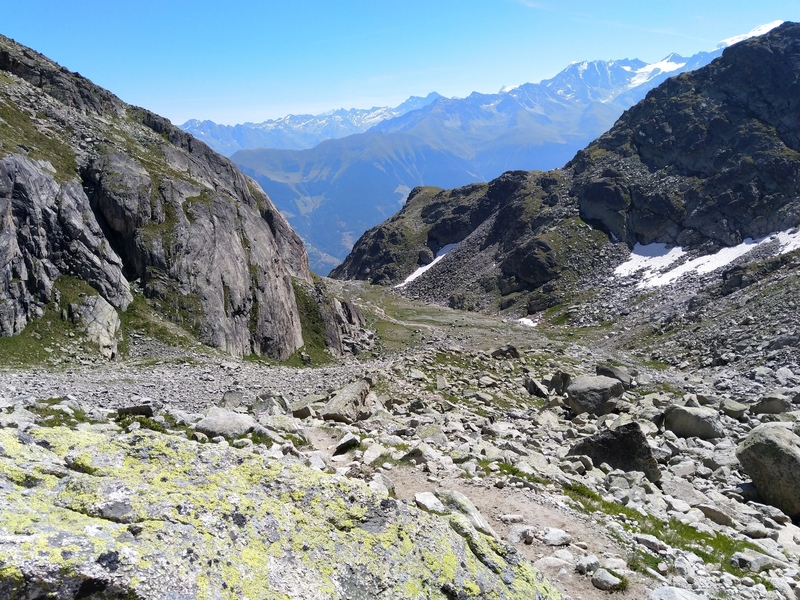 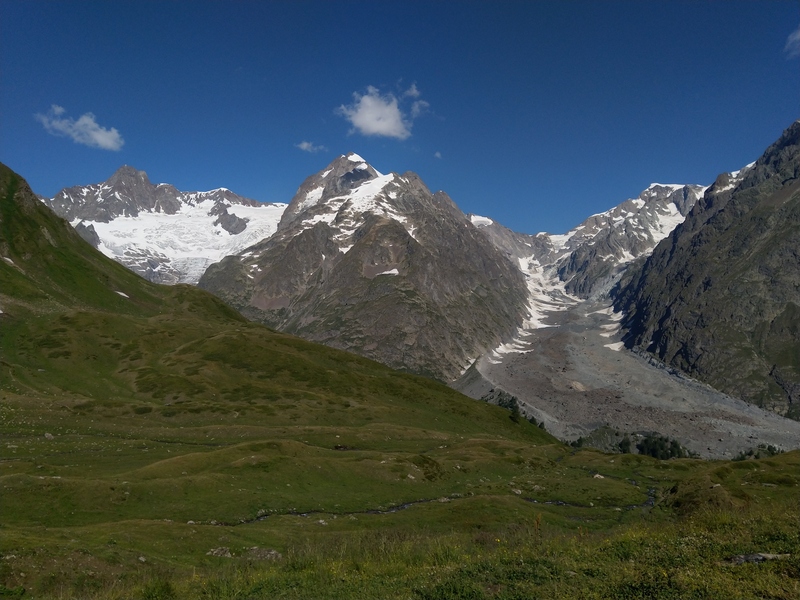 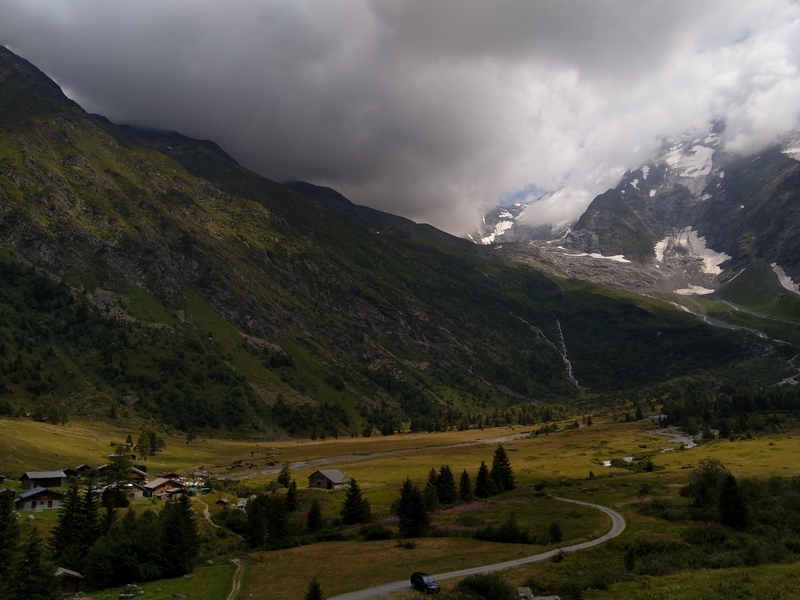 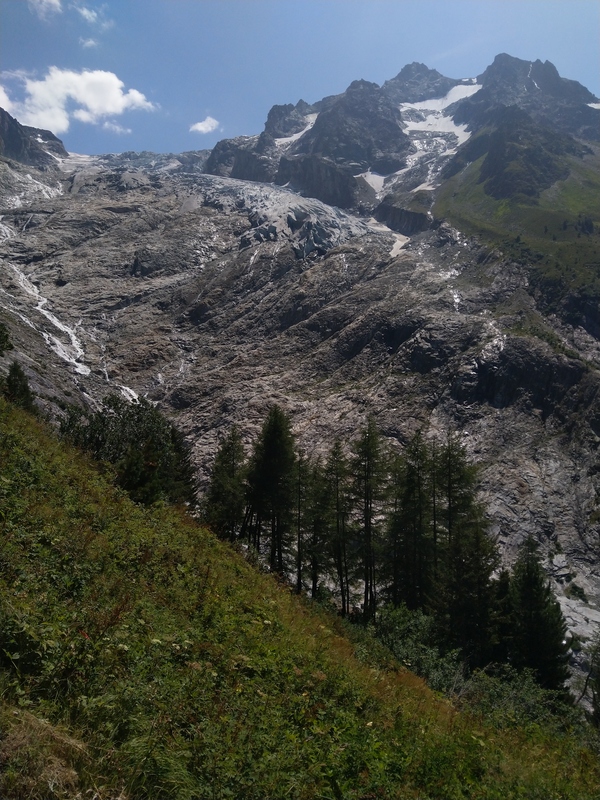 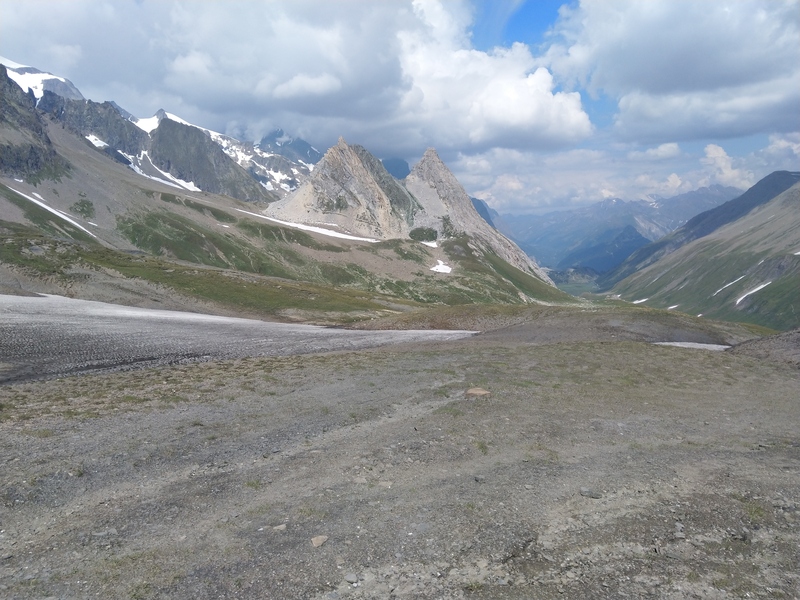 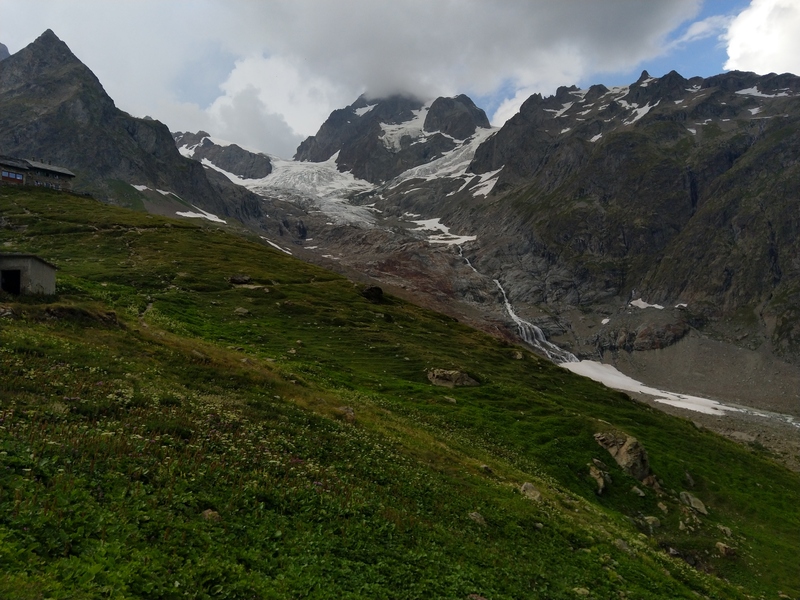 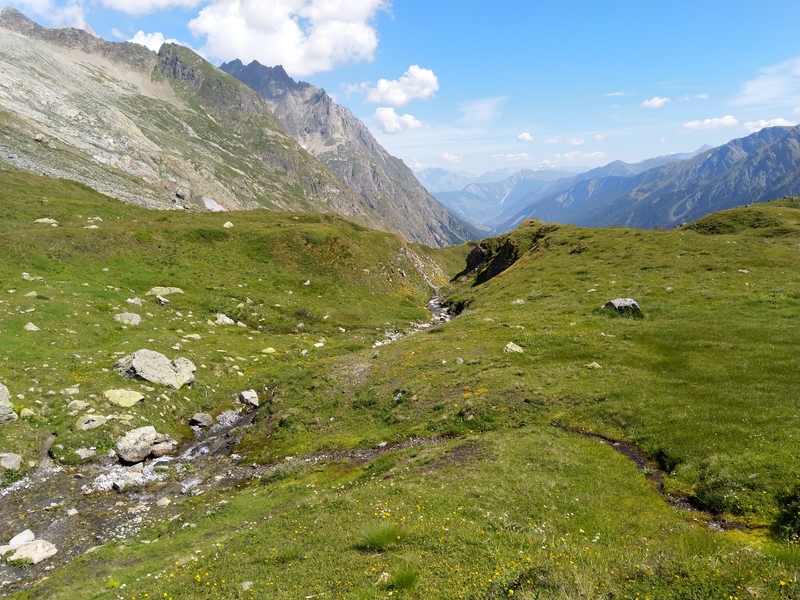 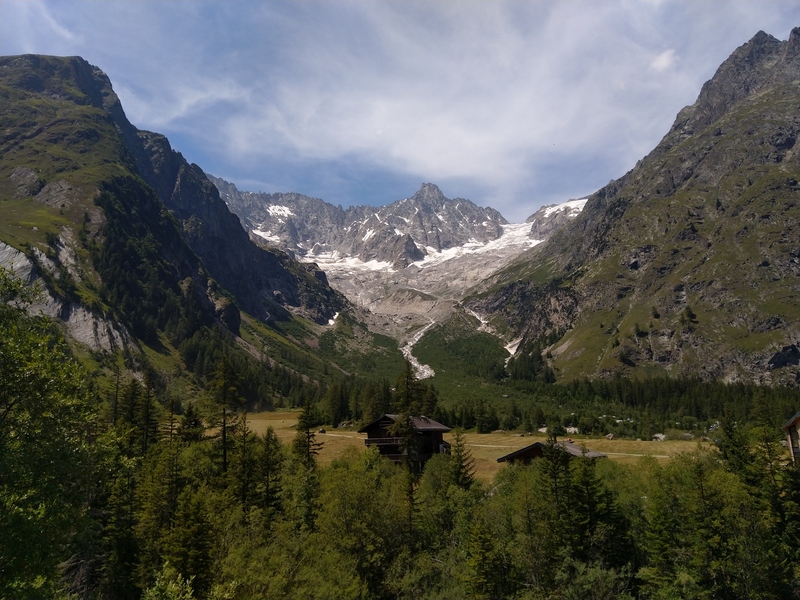 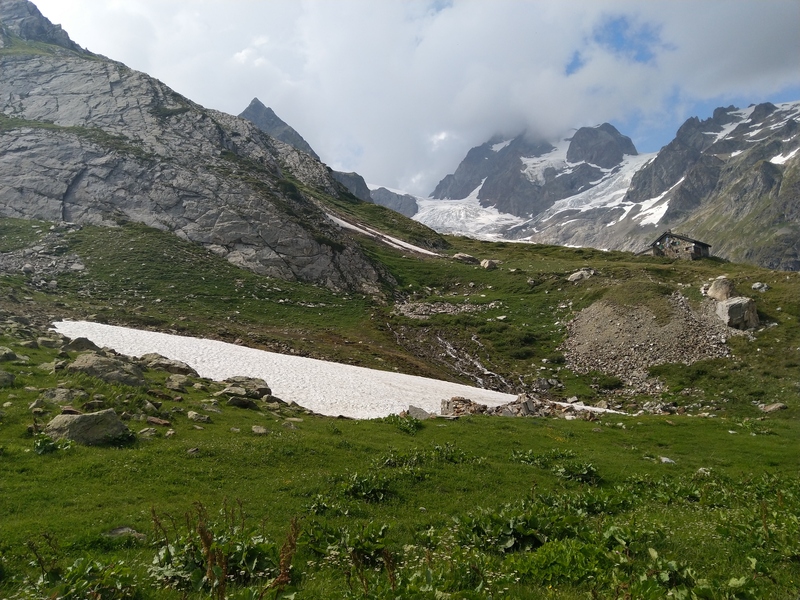 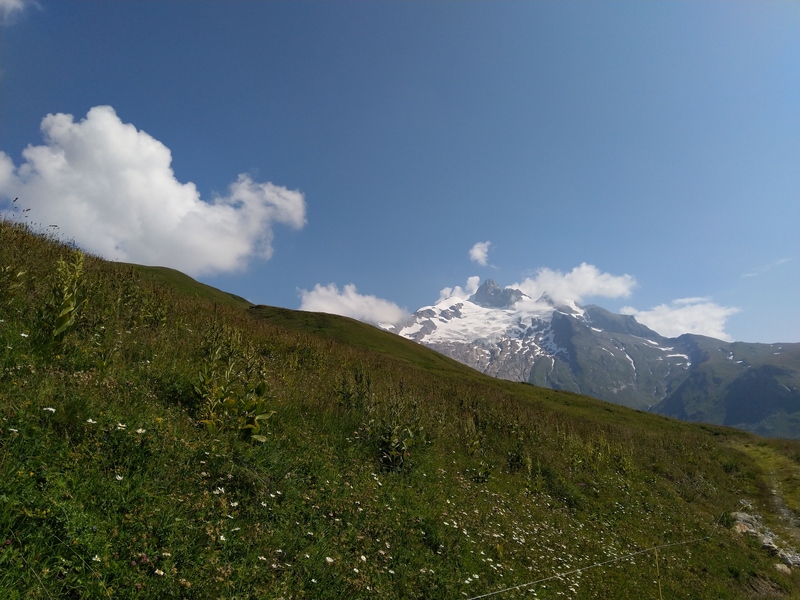 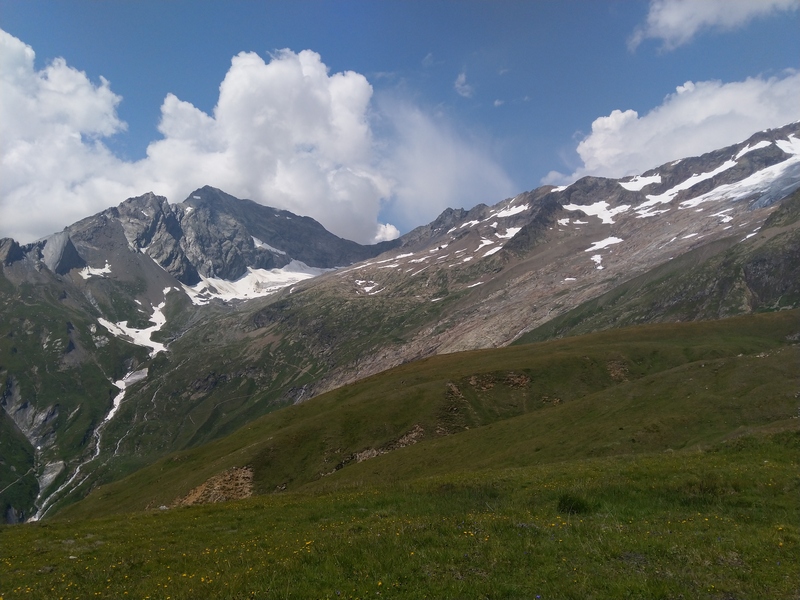 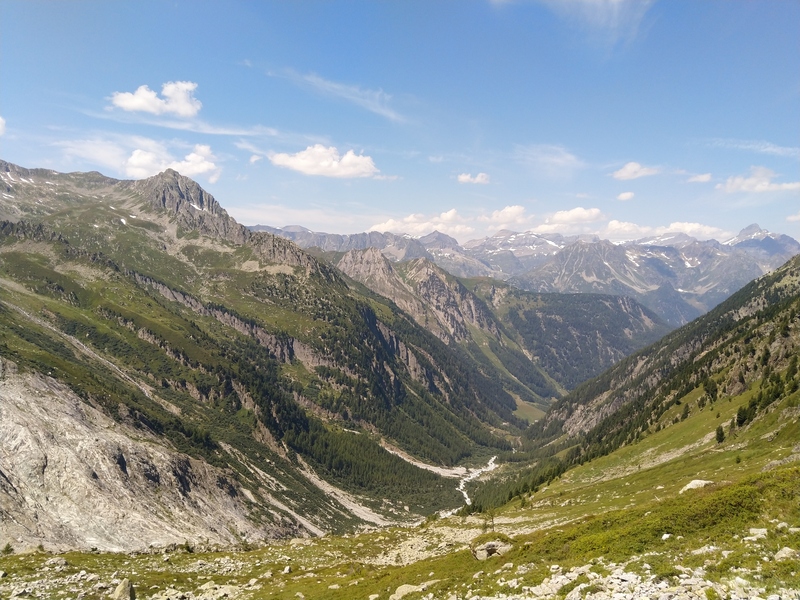 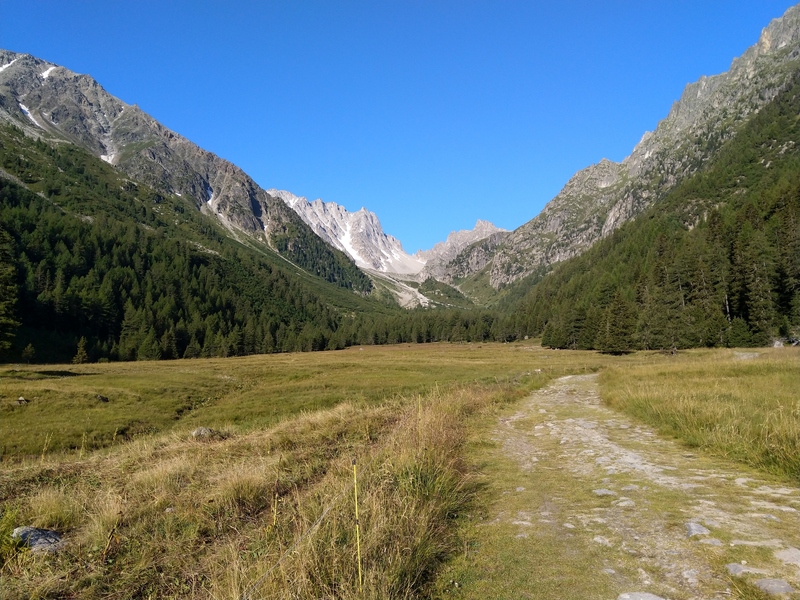 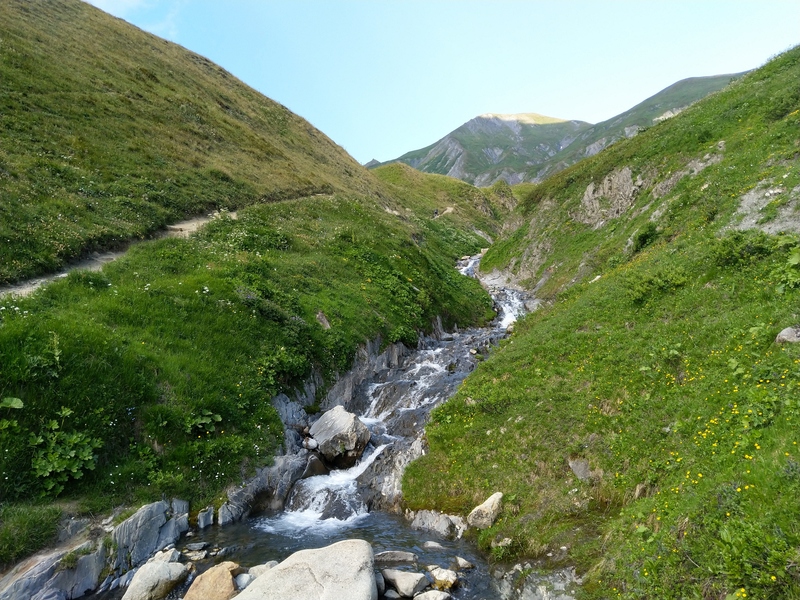 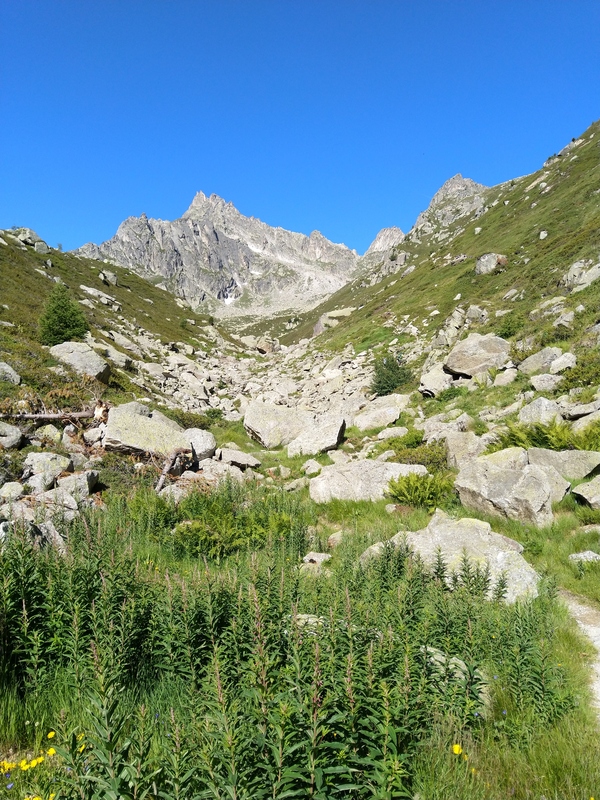 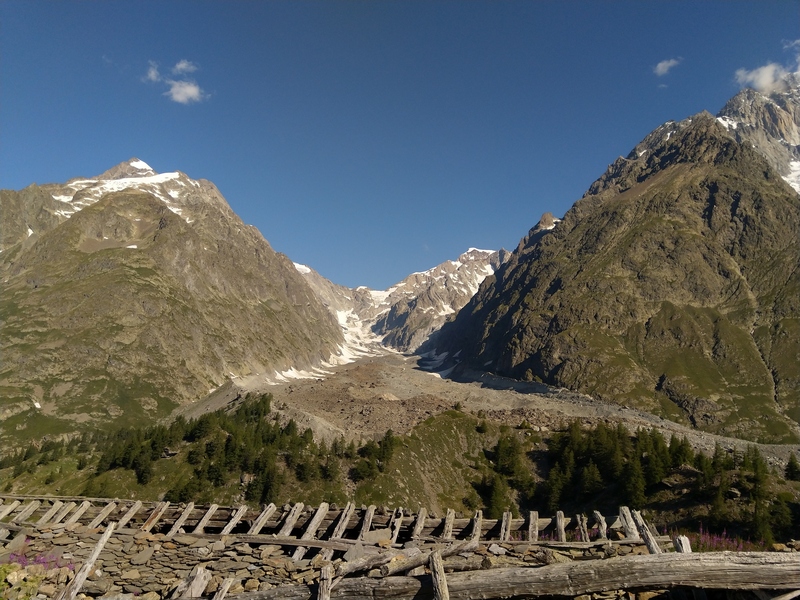 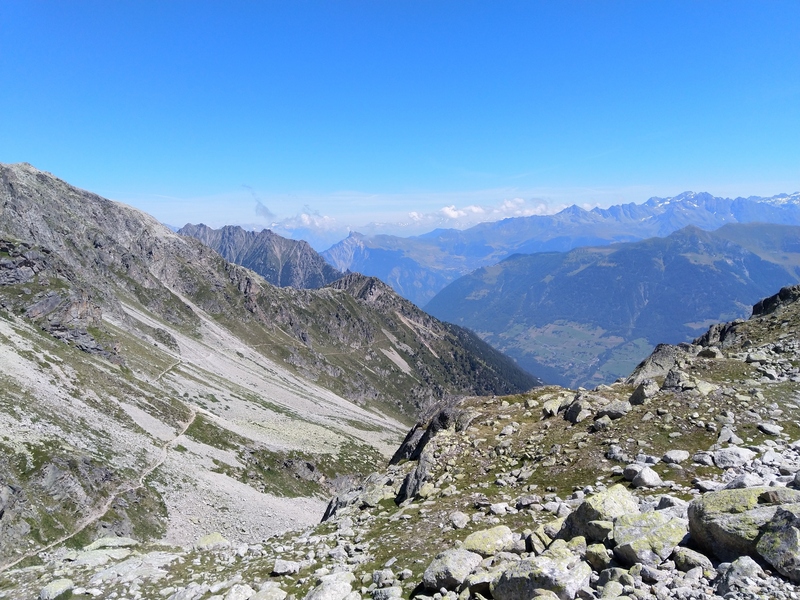 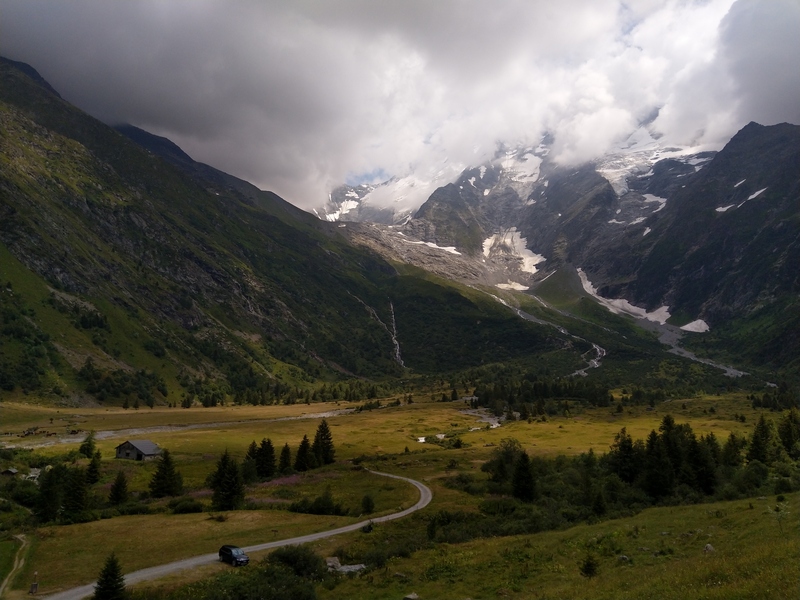 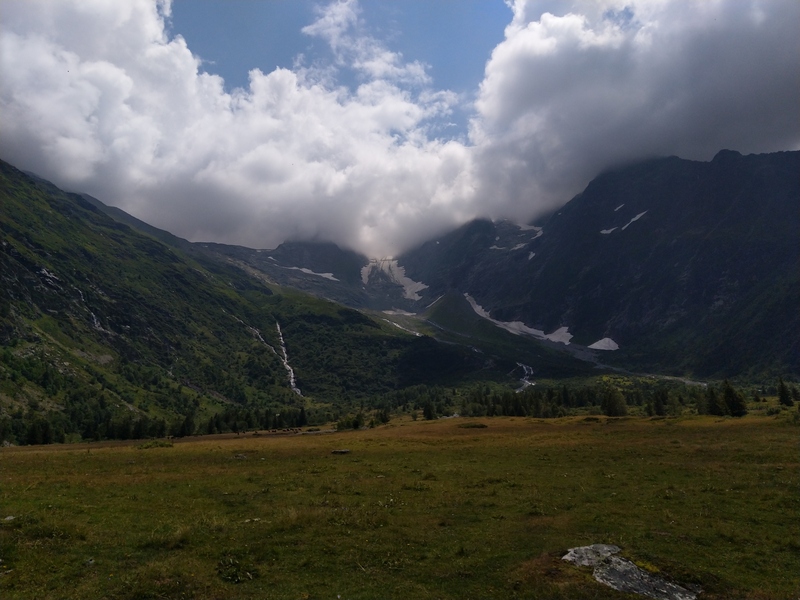 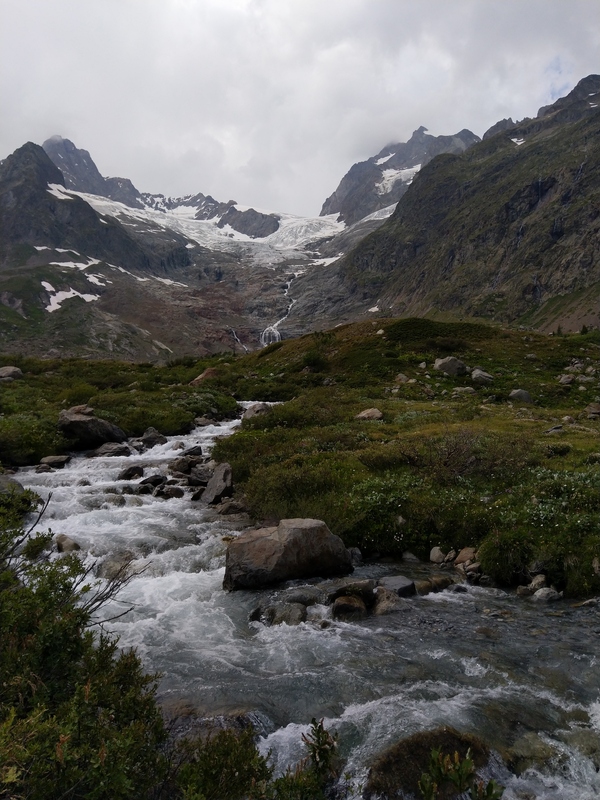 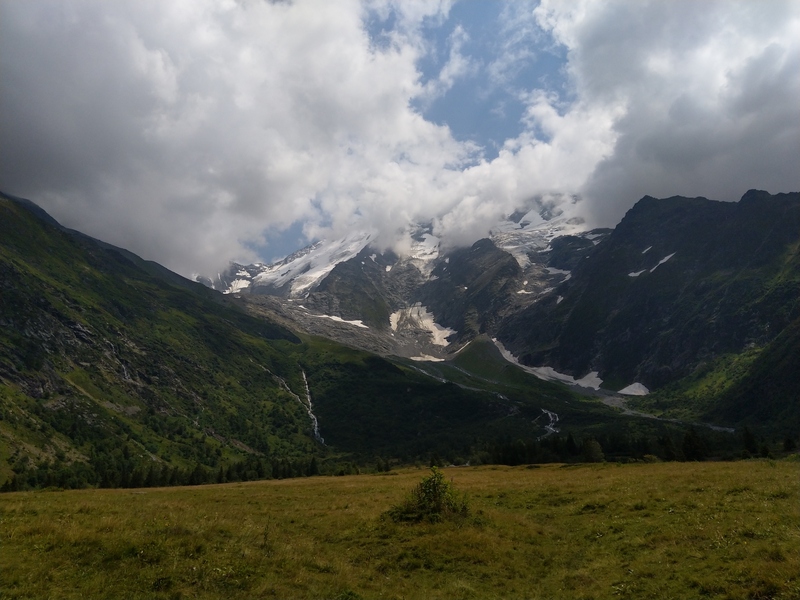 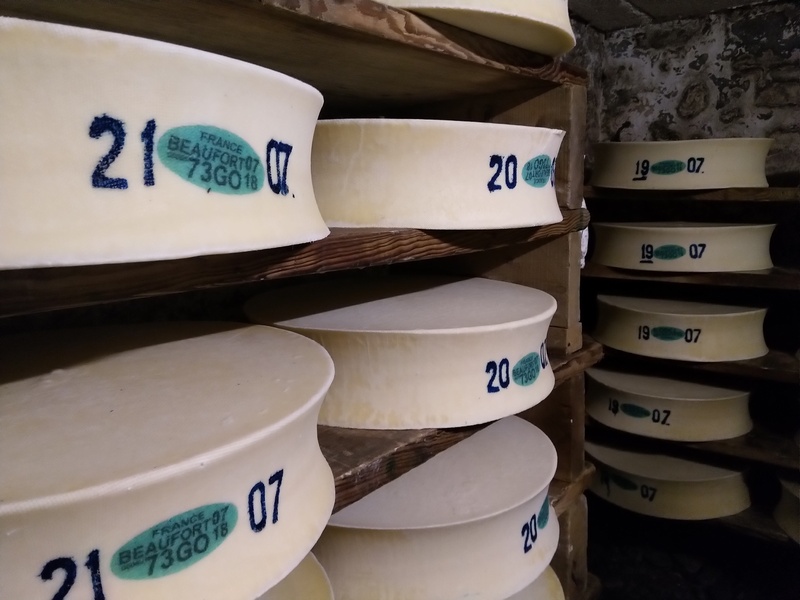 A long descent from the Col de la Croix du Bonhomme to reach the Ville des Glaciers where we bought some tasty cheese (Beaufort), before climbing the Col de la Seigne, passing in front of the Elisabetta refuge, and reaching the Combal refuge down in the valley. 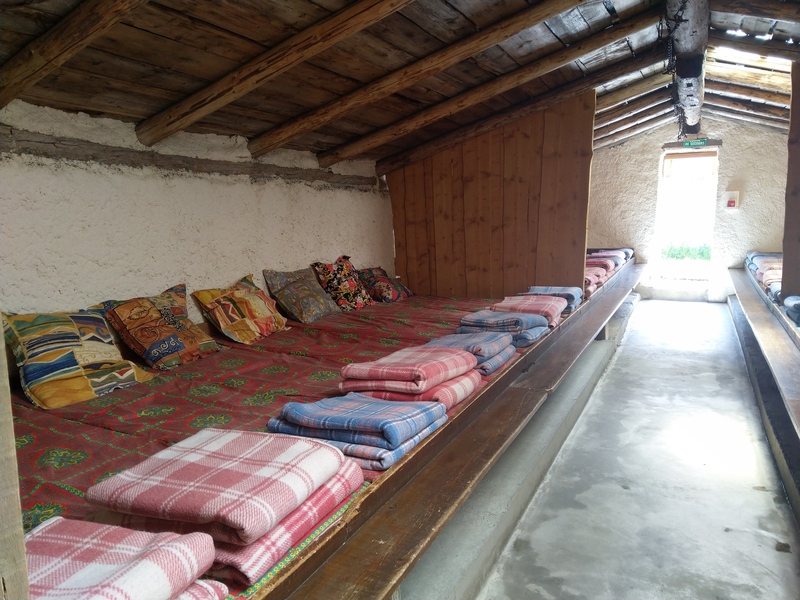 Refuge Combal (IT) - Refuge Elena (IT). 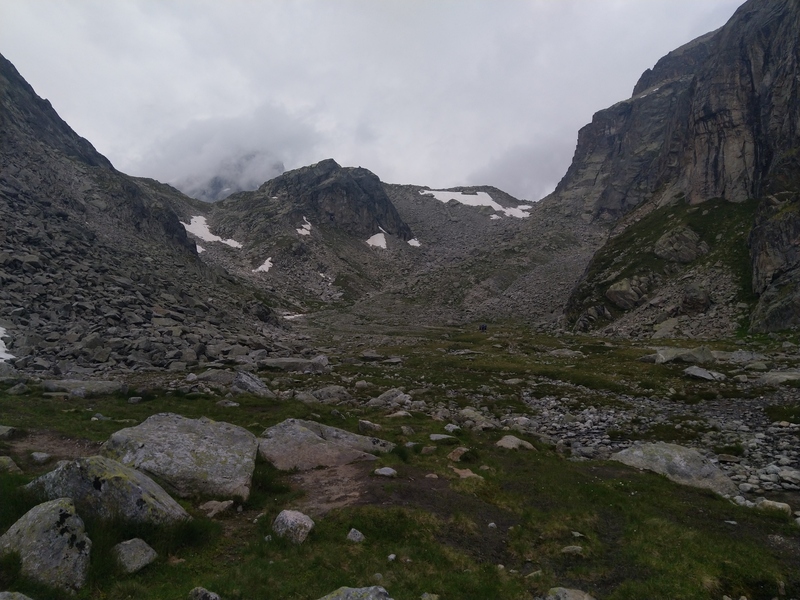 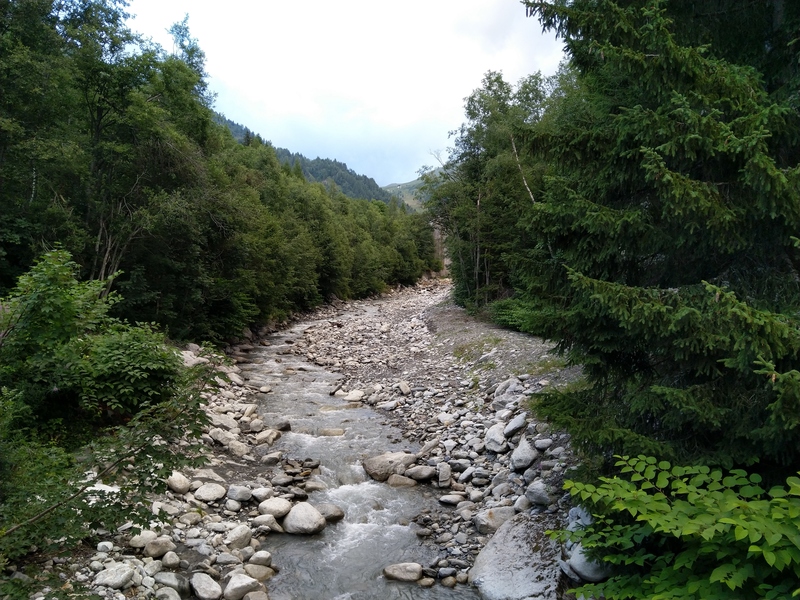 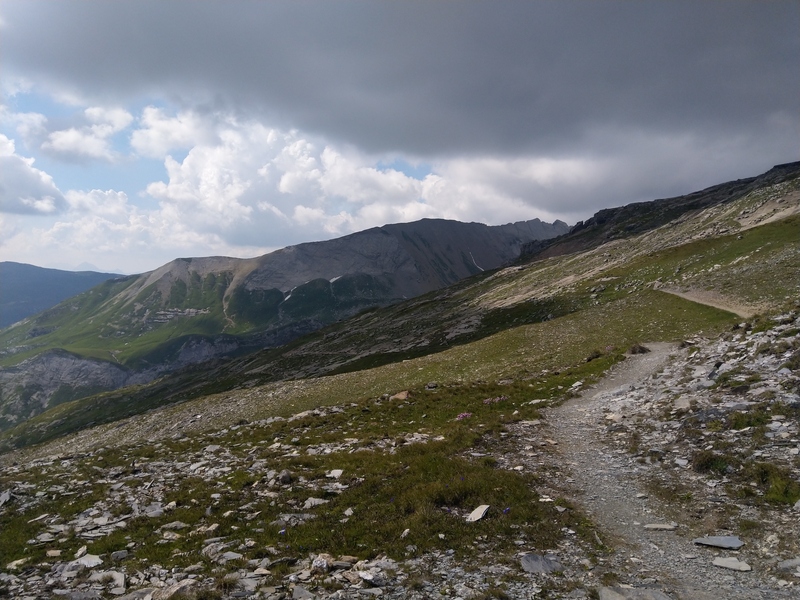 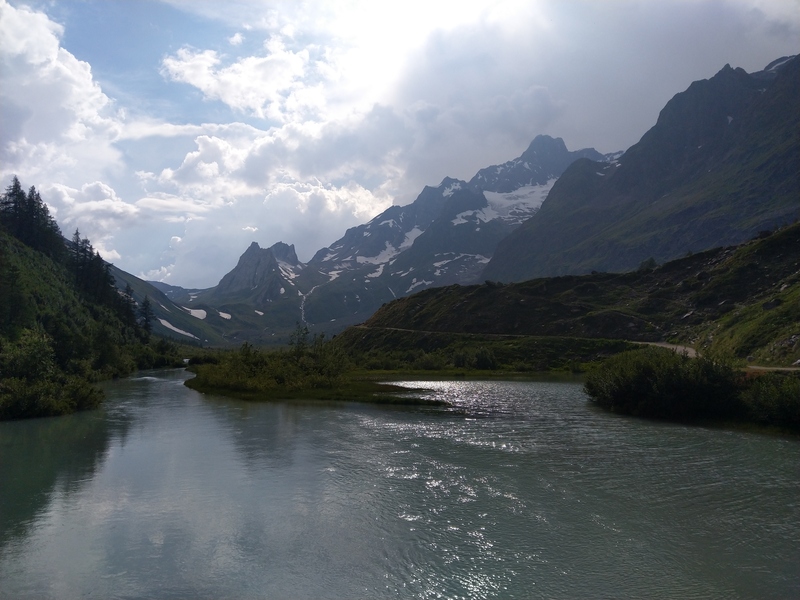 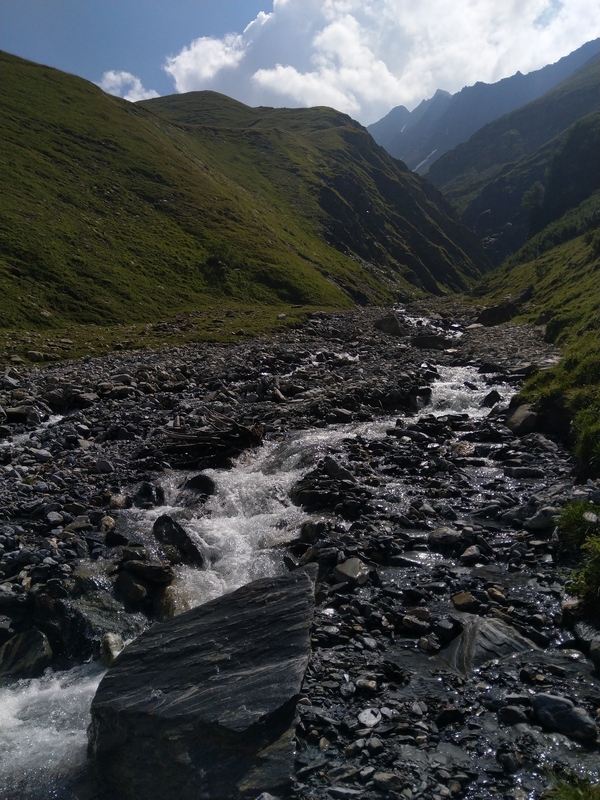 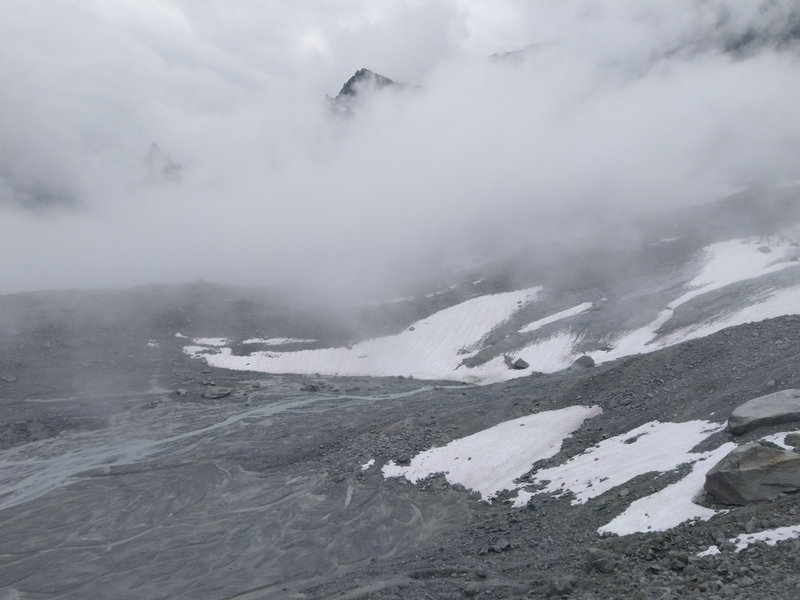 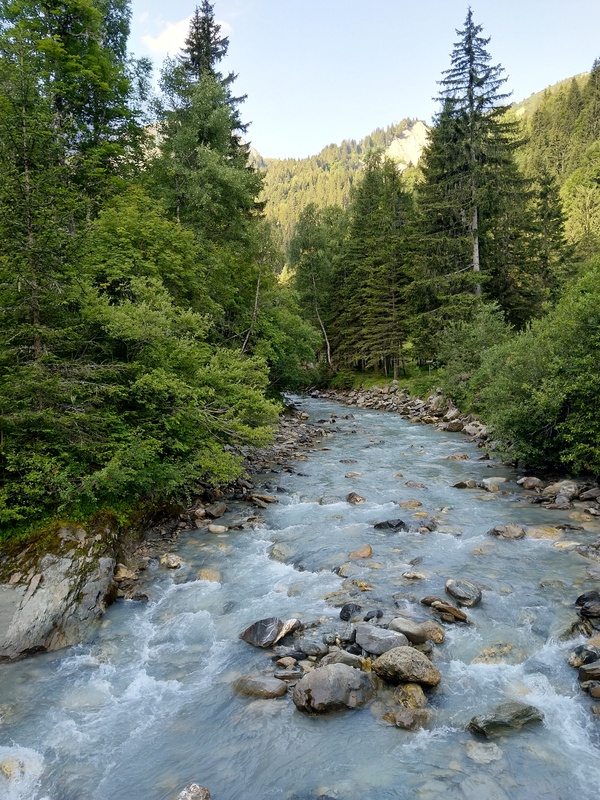 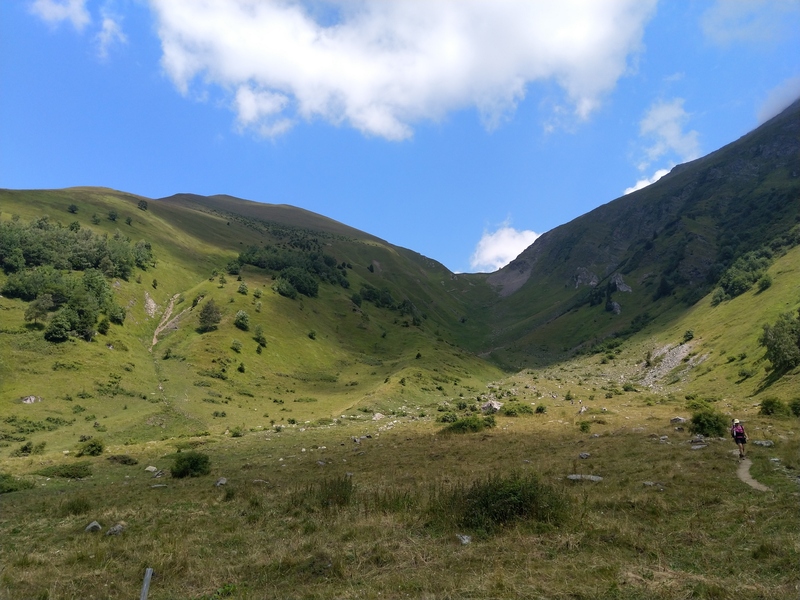 We reached Courmayer under a severe heat where we took a bus to bring us at a 2h walk from the Elena refuge while a storm brought a lot of rain. 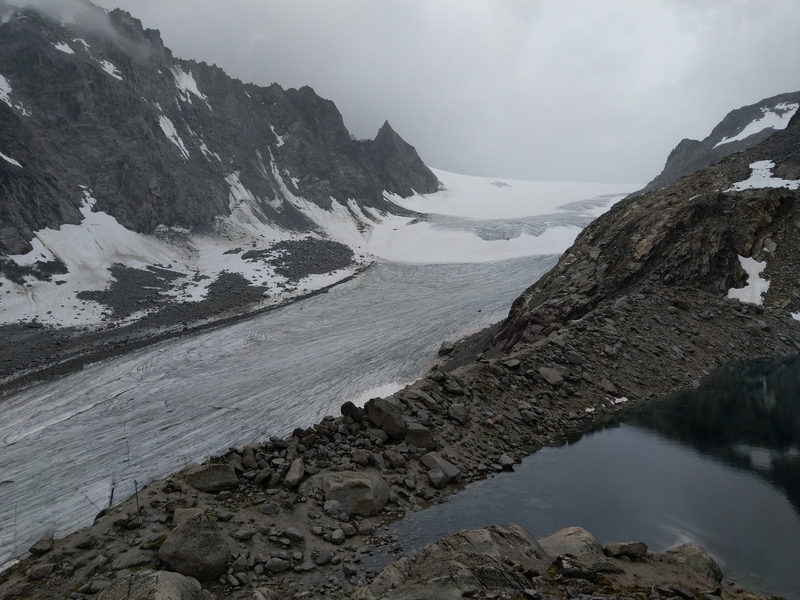 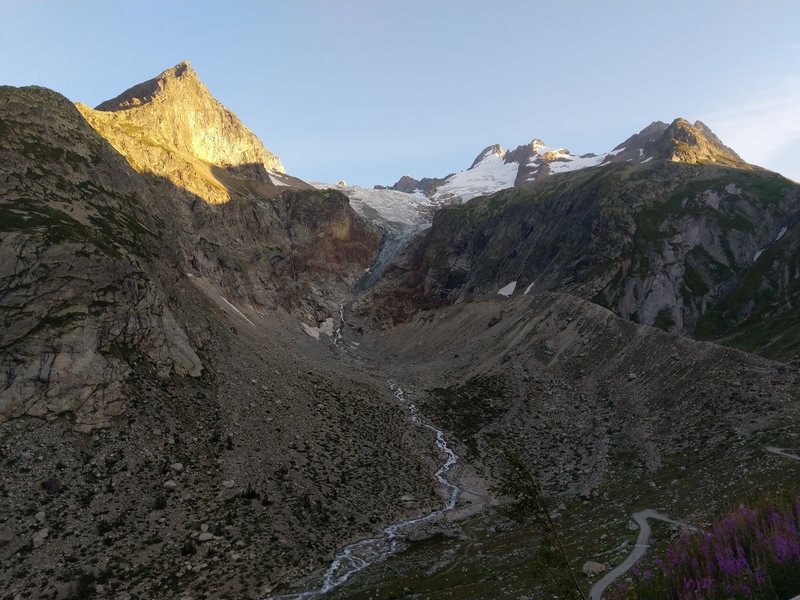 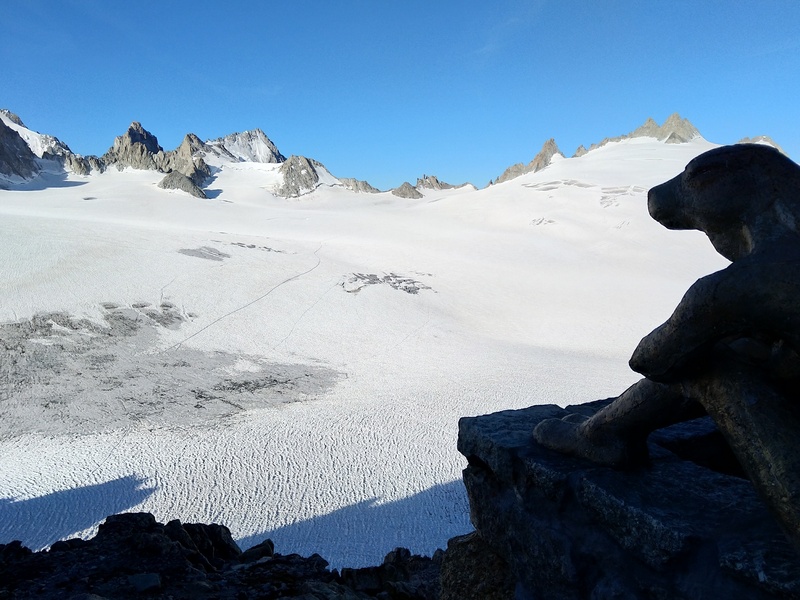 The weather improved in the evening, offering pretty cool views on the Pré de Bar glacier. 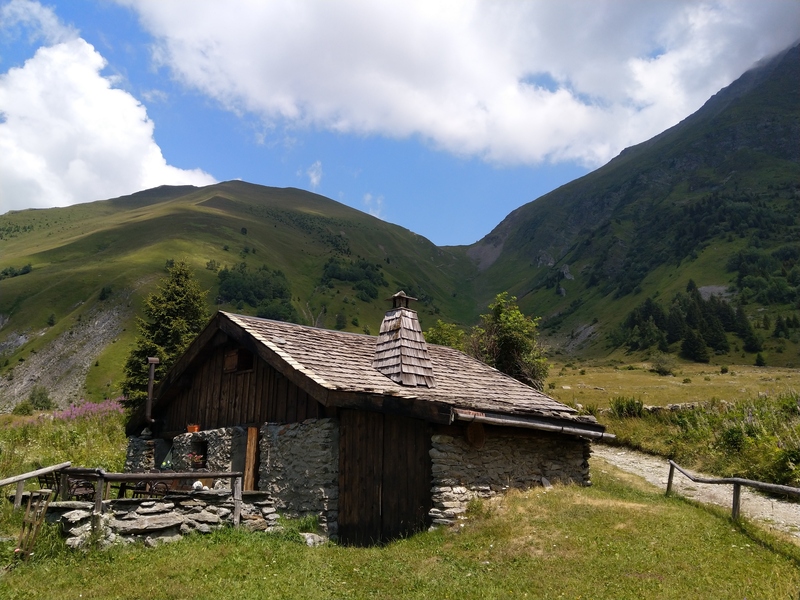 Refuge Elena (IT) - La Fouly (CH). 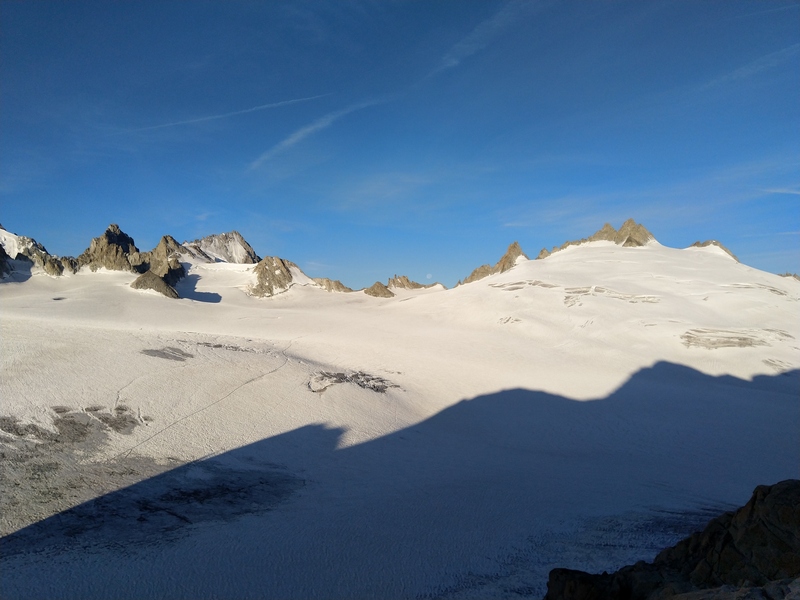 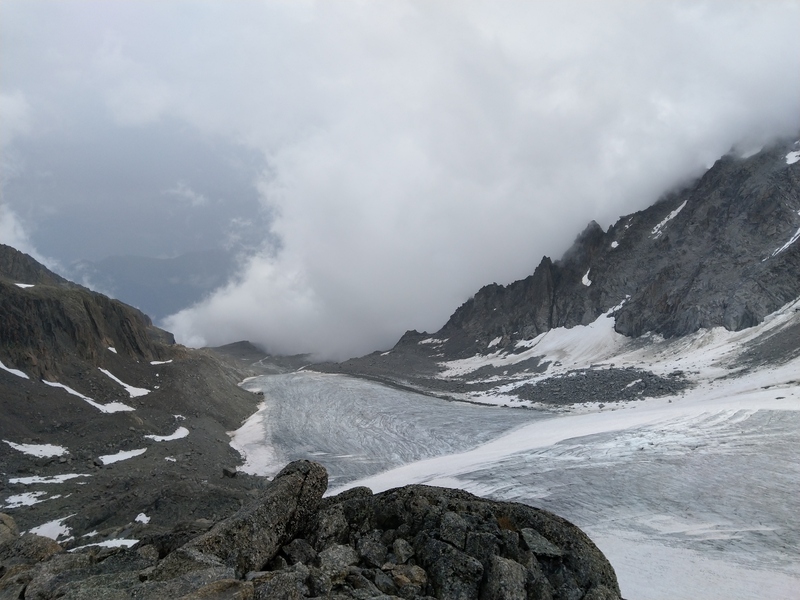 This was the shortest day of the journey: it started by climbing the Col du Grand Ferret, then crossing the Swiss border at the Col du Petit Ferret to finally descent to La Fouly, with once again a nice view on the Glacier de l'A Neuve. 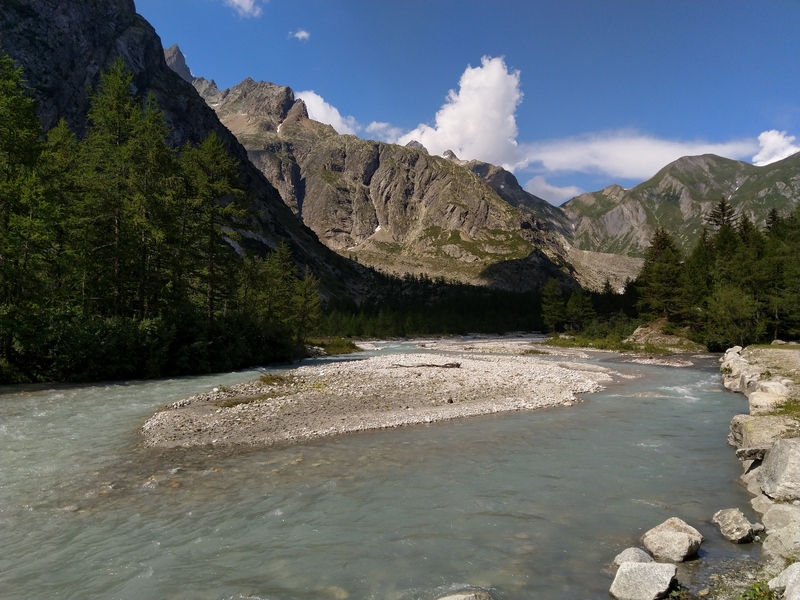 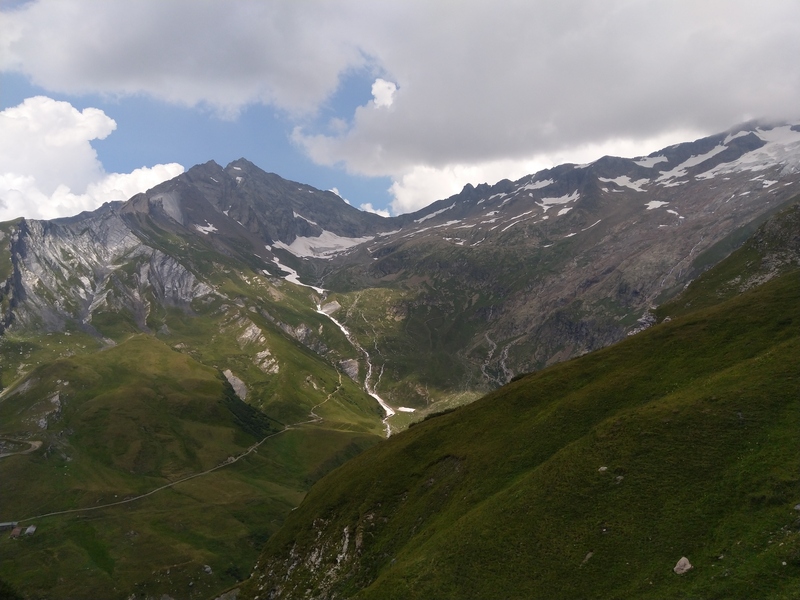 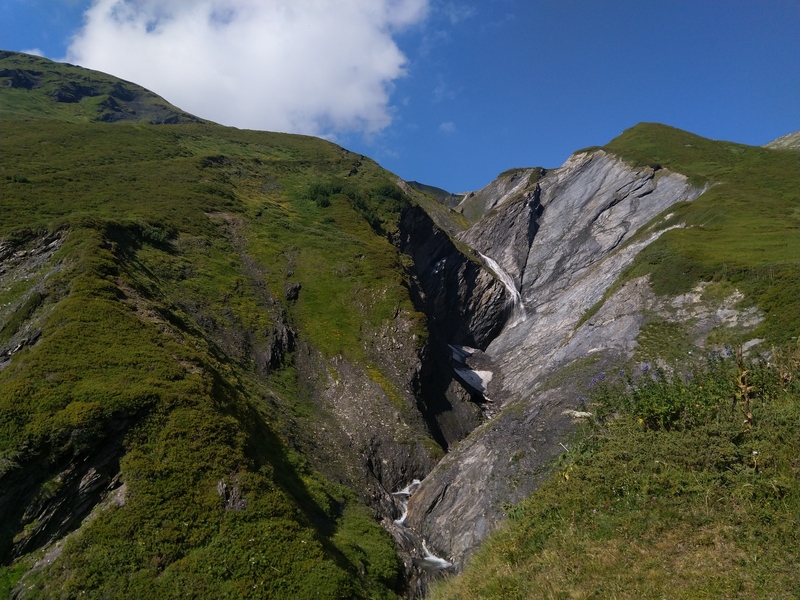 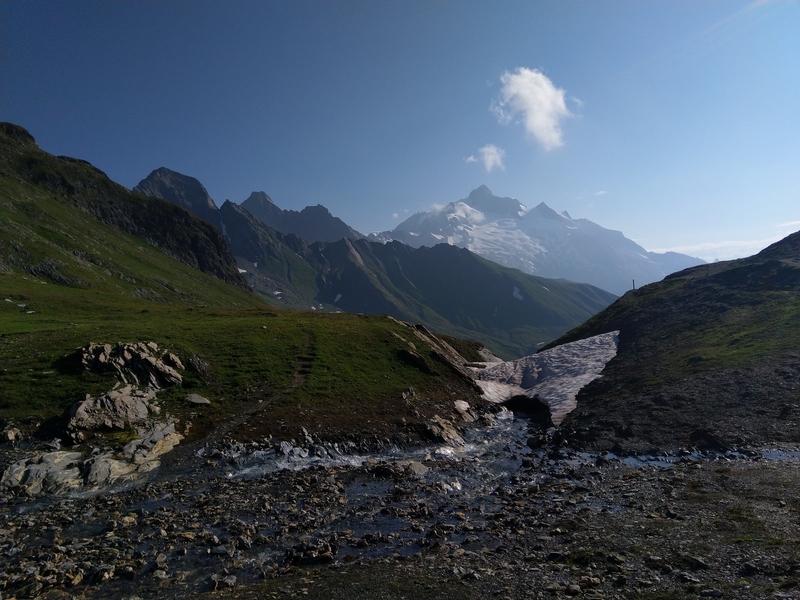 La Fouly (CH) - Refuge du Trient (CH). 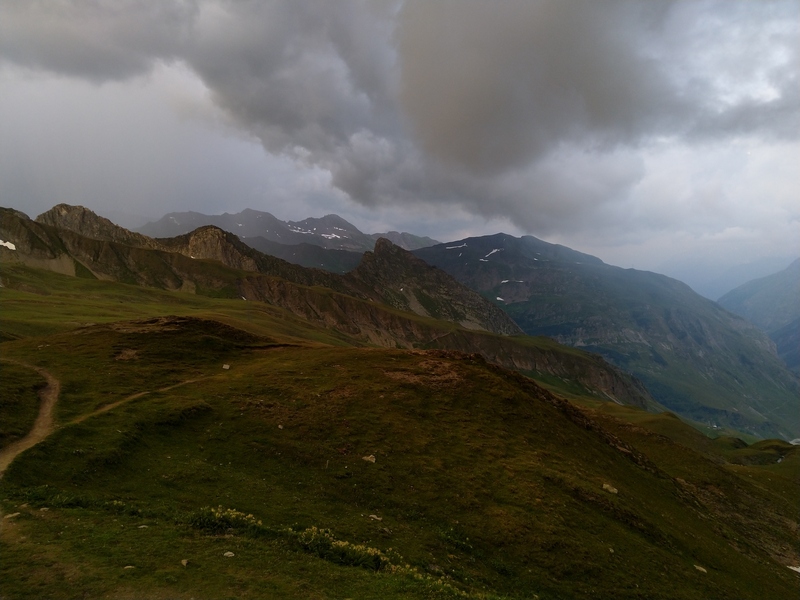 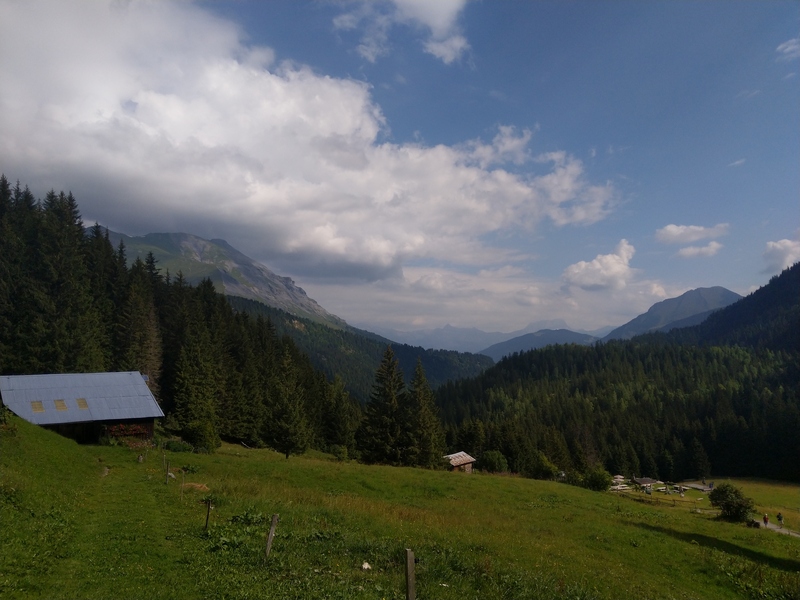 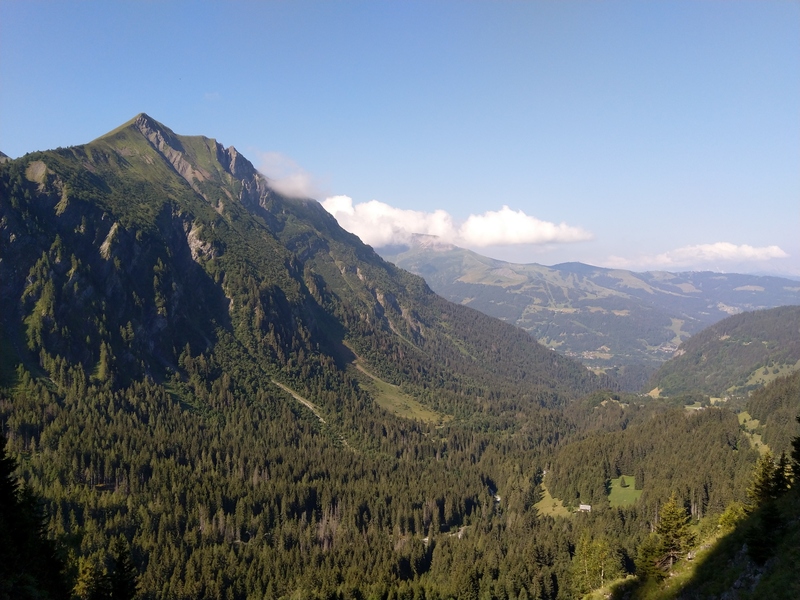 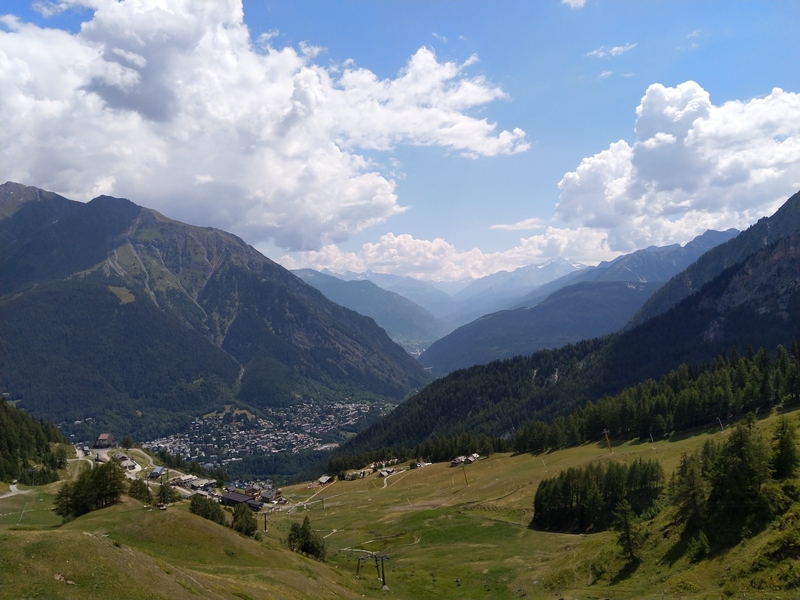 We started by taking the bus to the La Breya chair lift, and started to climb to la cabane d'Orny under a threatening weather. 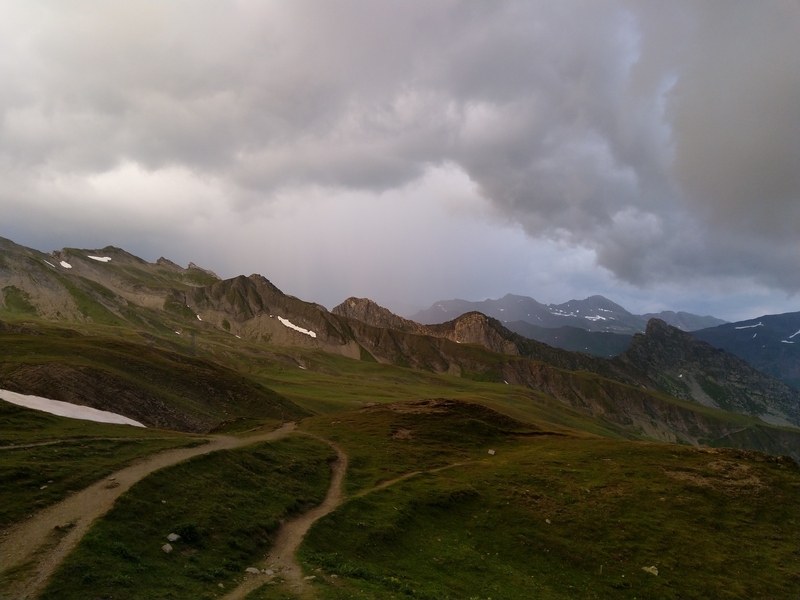 The storm occured while we were climbing and soaked us all, with rain, snow and hail. 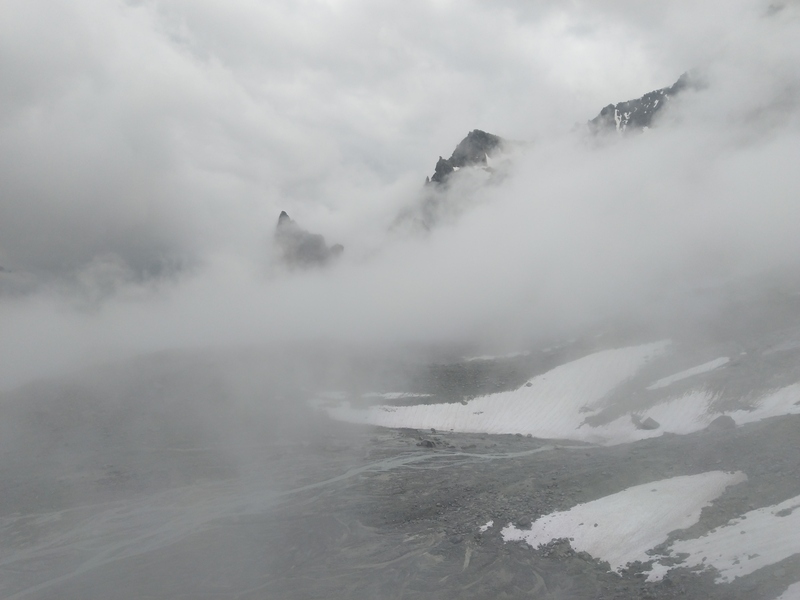 It made the landscape completely disappear behind the clouds, that was a very strange feeling. 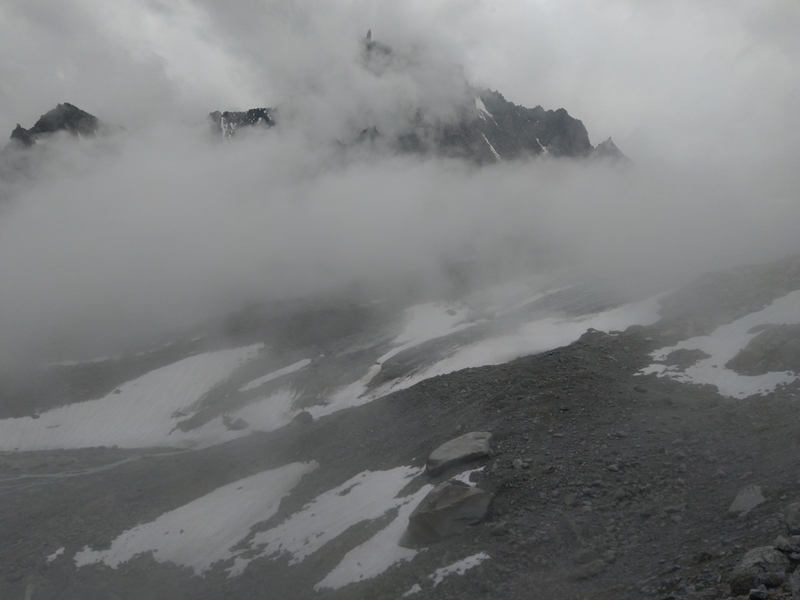 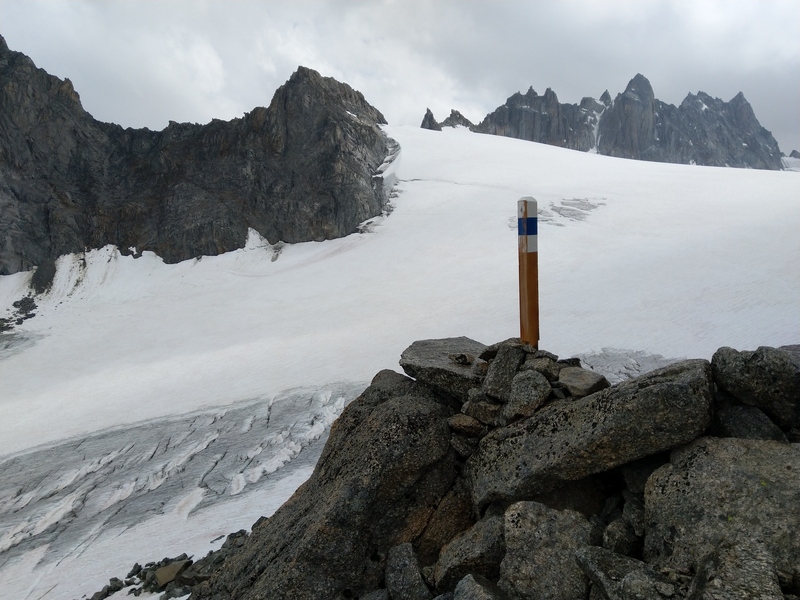 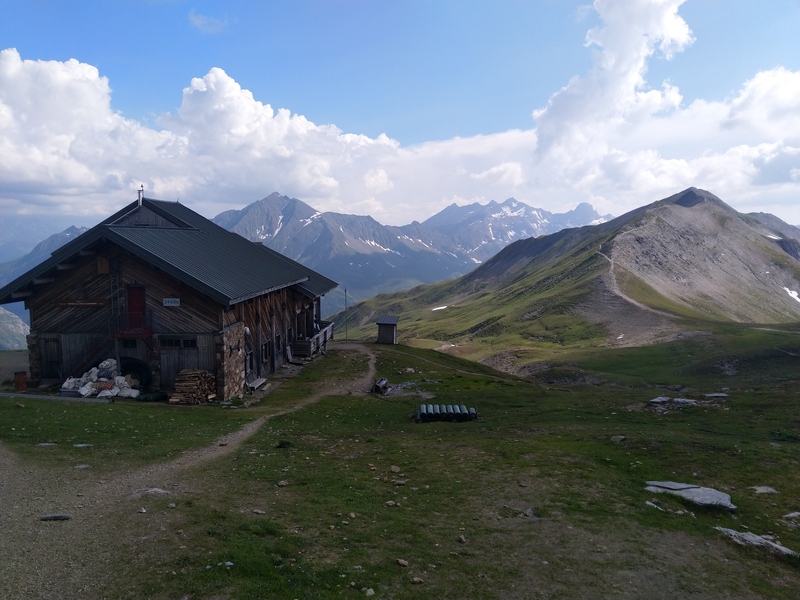 After a break to la cabane d'Orny, the climbing continued up to le refuge du Trient, the highest night of the journey at 3200m. 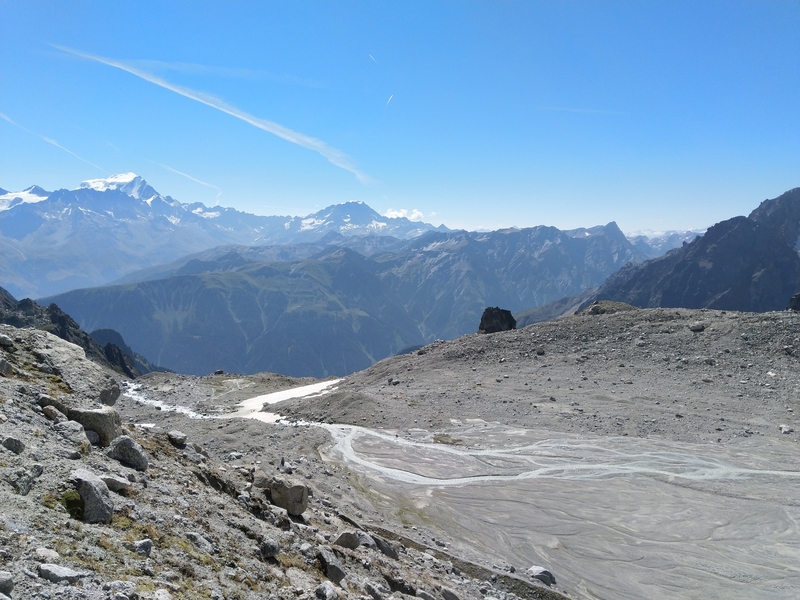 It offers a unique view over the Plateau de Trient, with the Aiguille du Tour, Col du Midi des Grands, Aiguilles Dorées, Col des Plines... 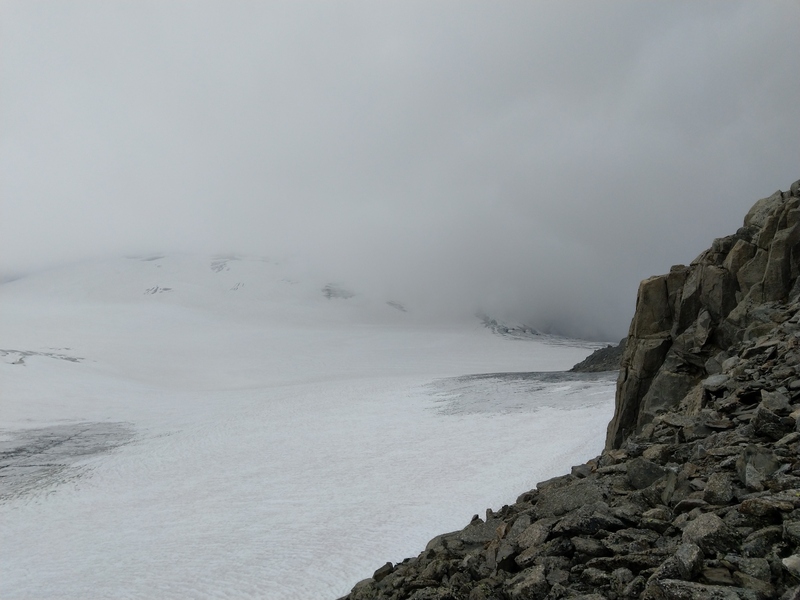 This place is an usual night on the Chamonix-Zermatt journey through the glaciers. 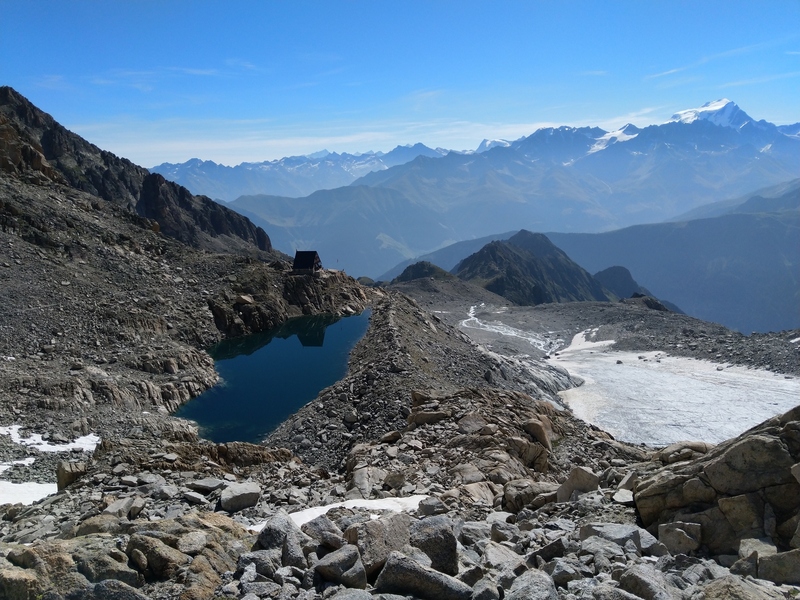 It offers a unique view over the Plateau de Trient, with the Aiguille du Tour, Col du Midi des Grands, Aiguilles Dorées, Col des Plines... 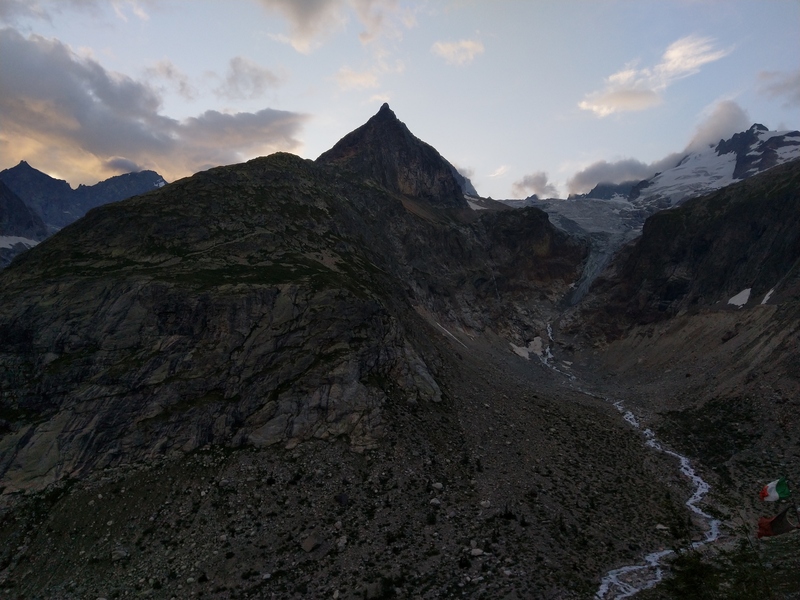 This place is an usual night on the Chamonix-Zermatt journey through the glaciers. 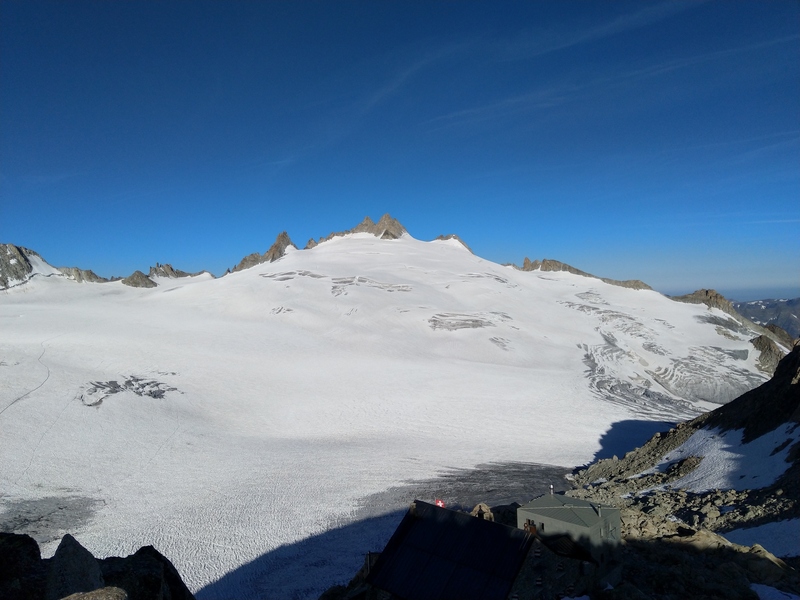 Refuge du Trient (CH) - Relais d'Arpette (CH). 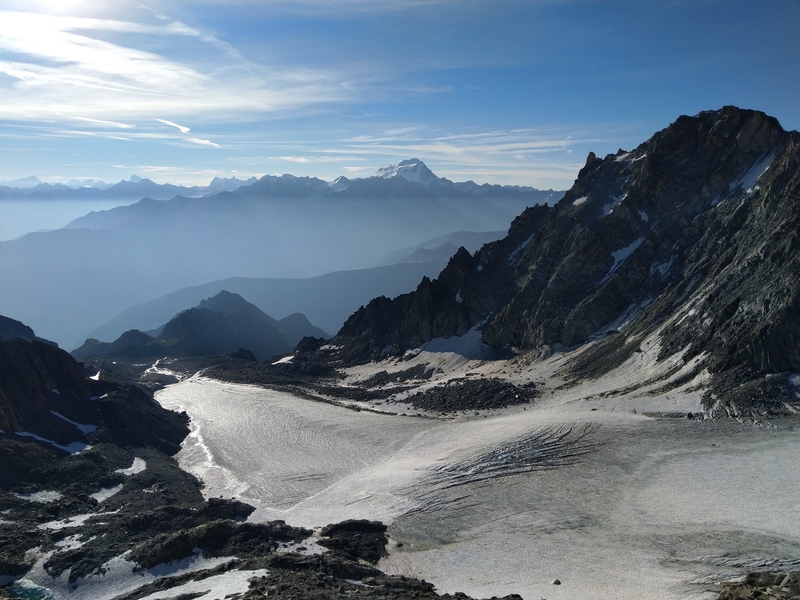 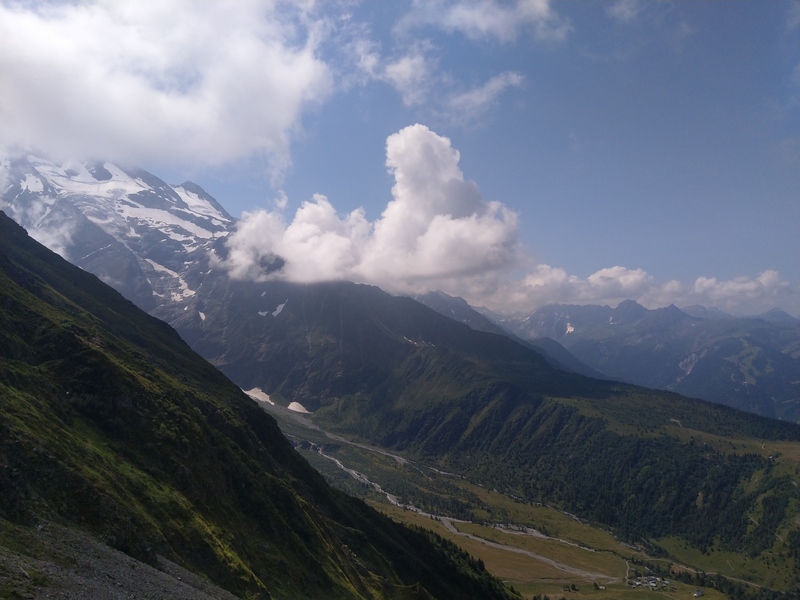 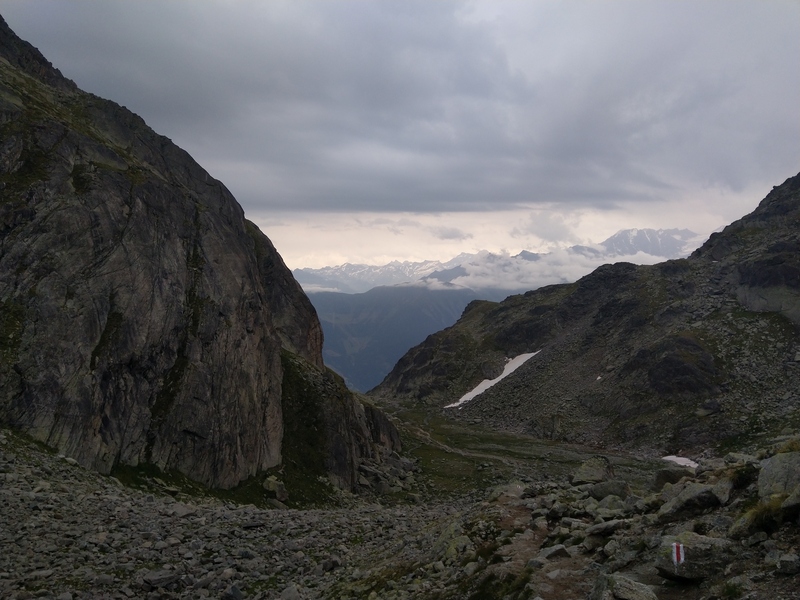 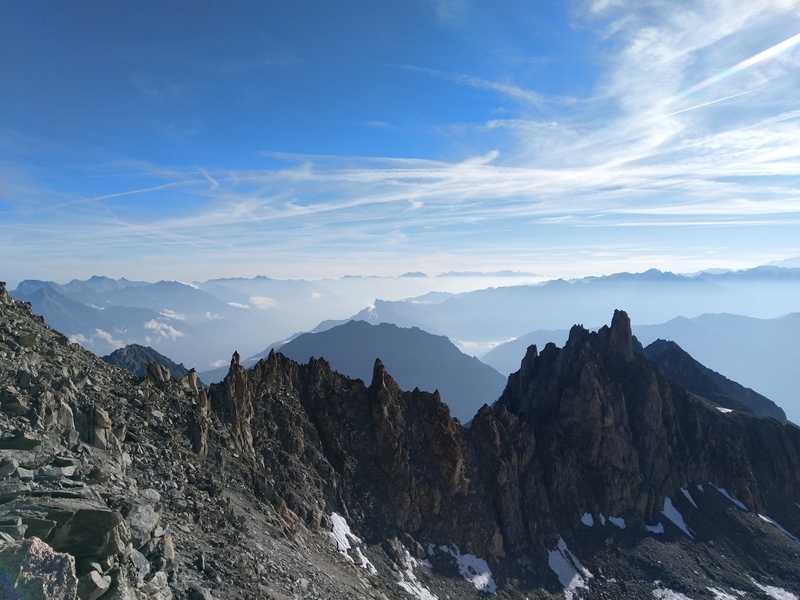 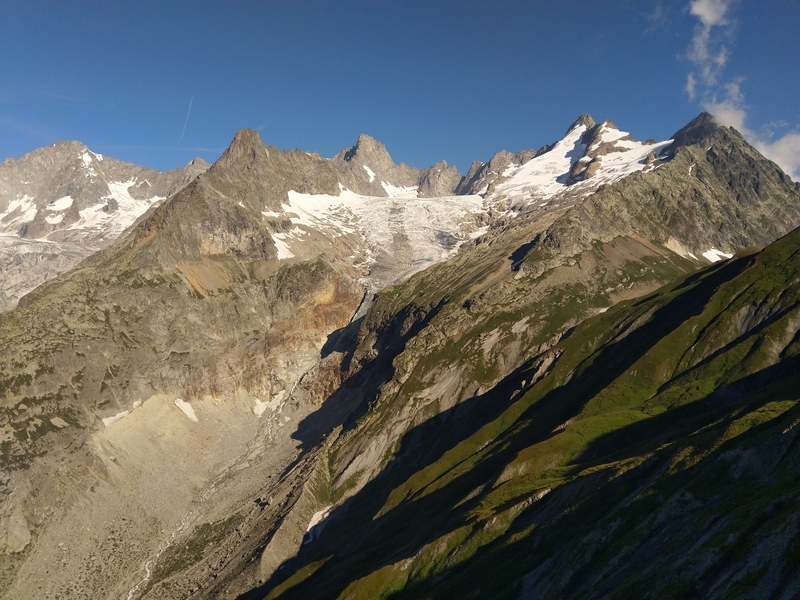 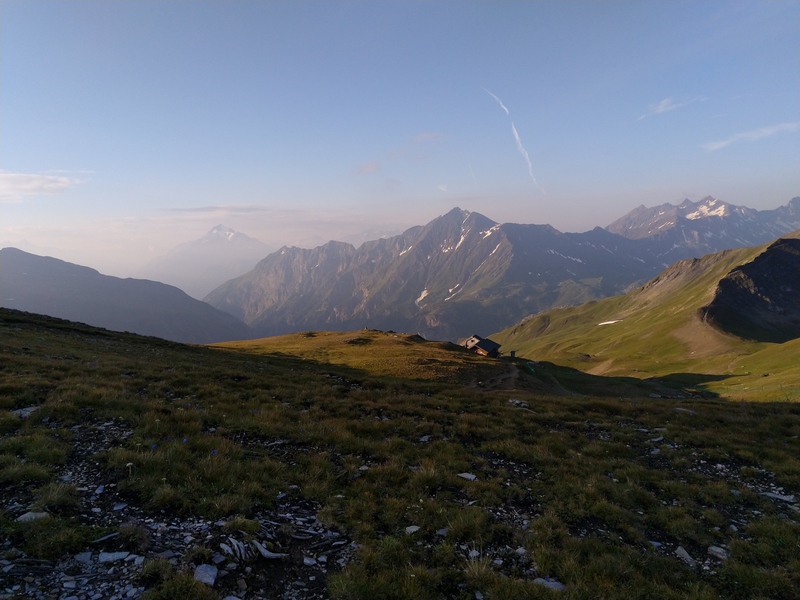 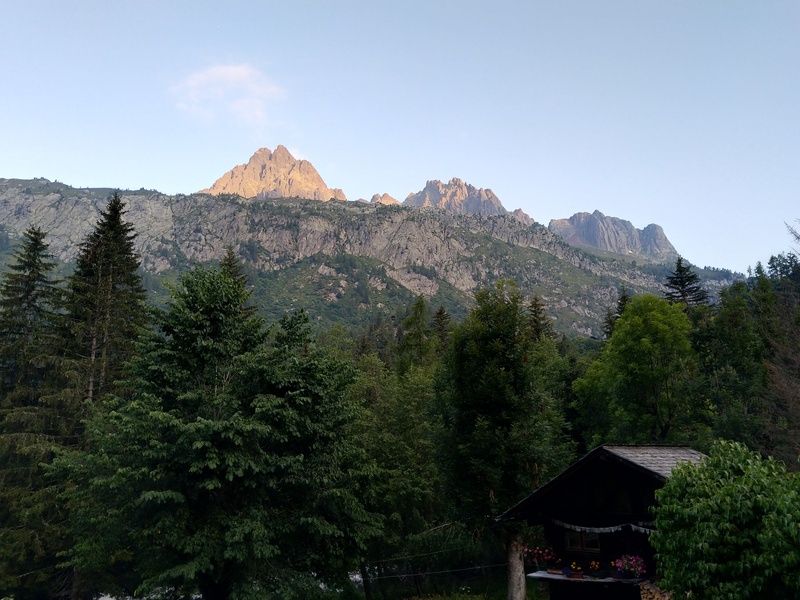 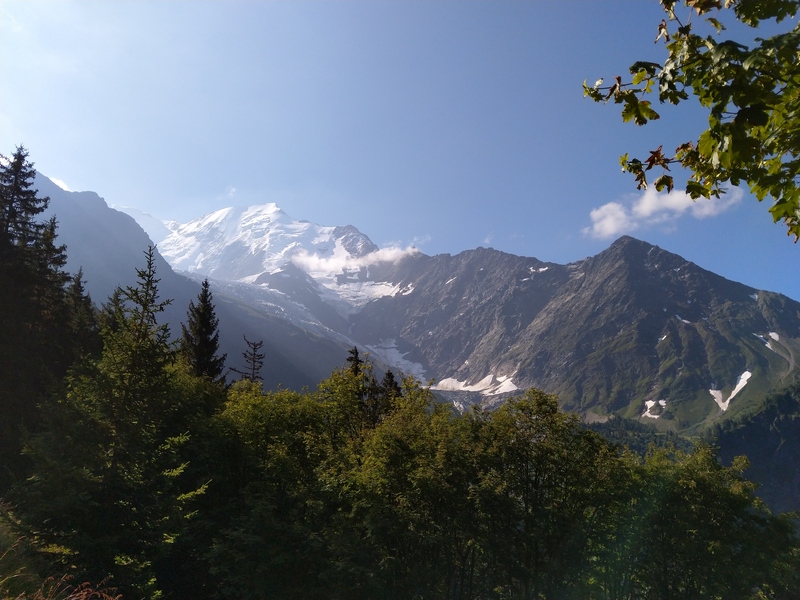 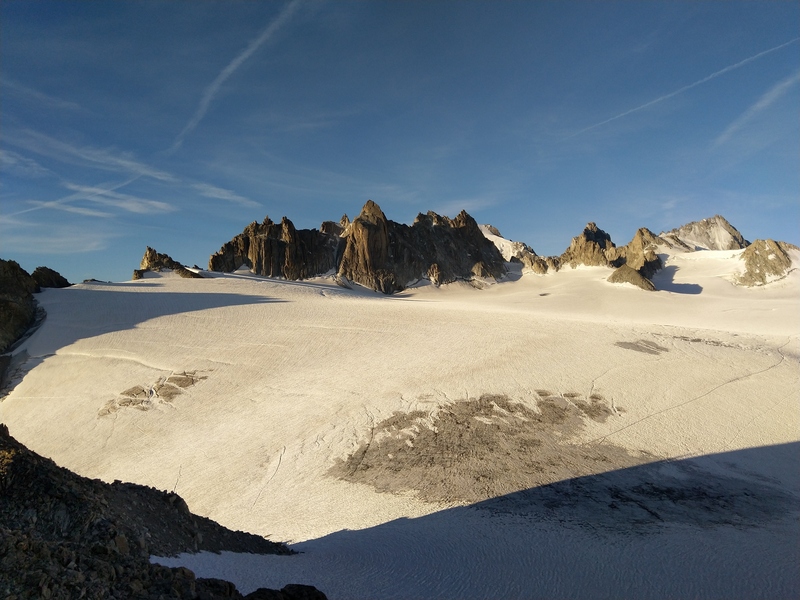 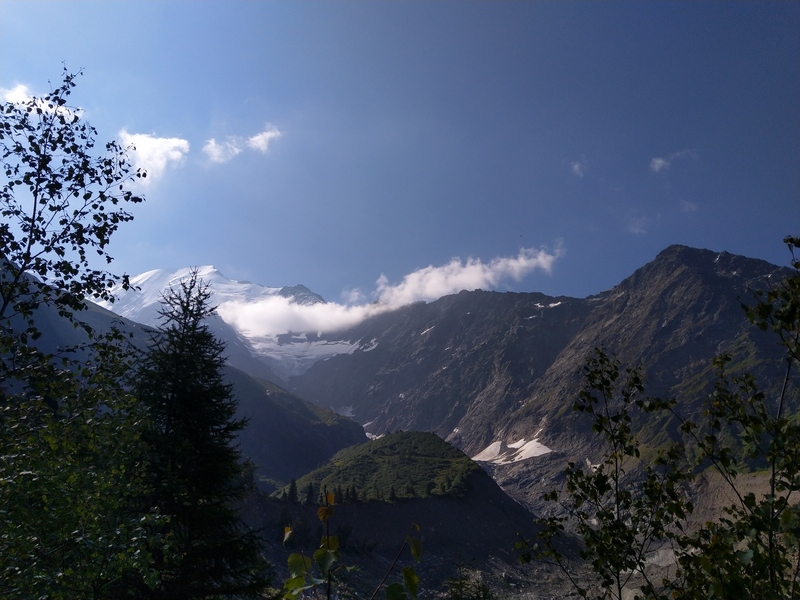 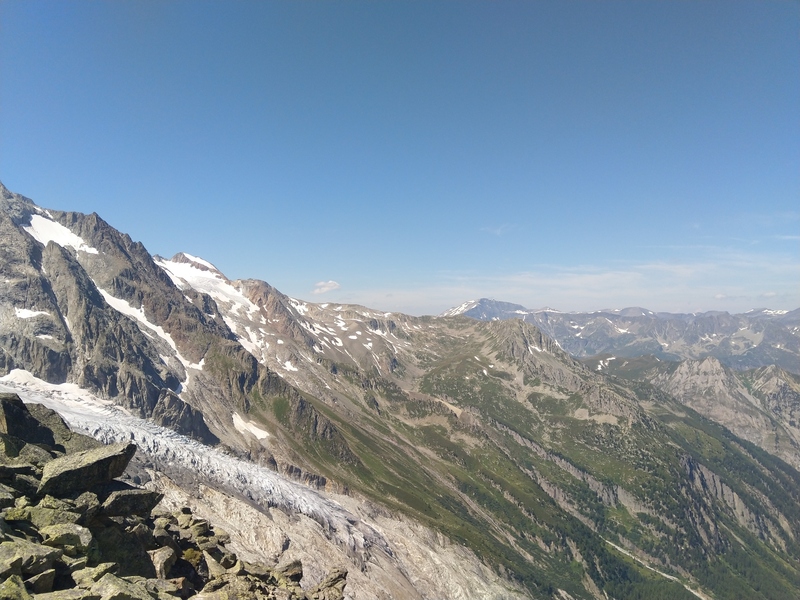 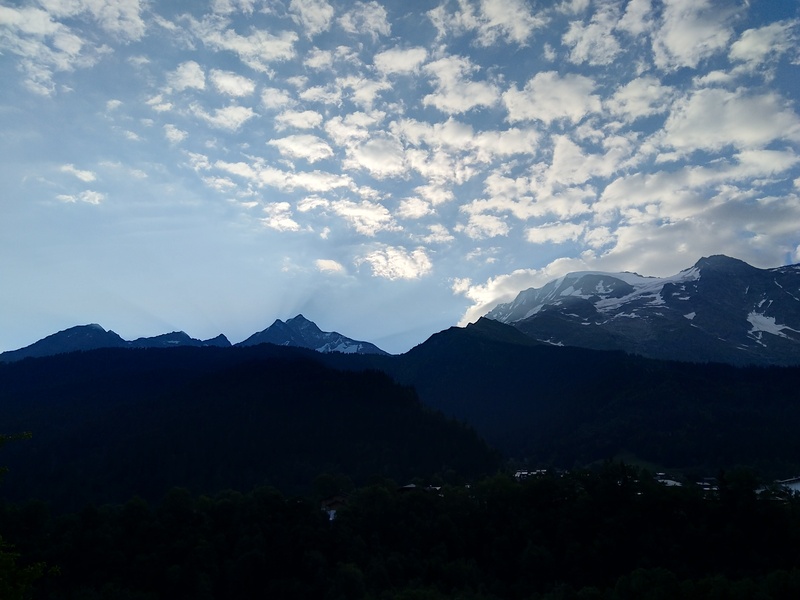 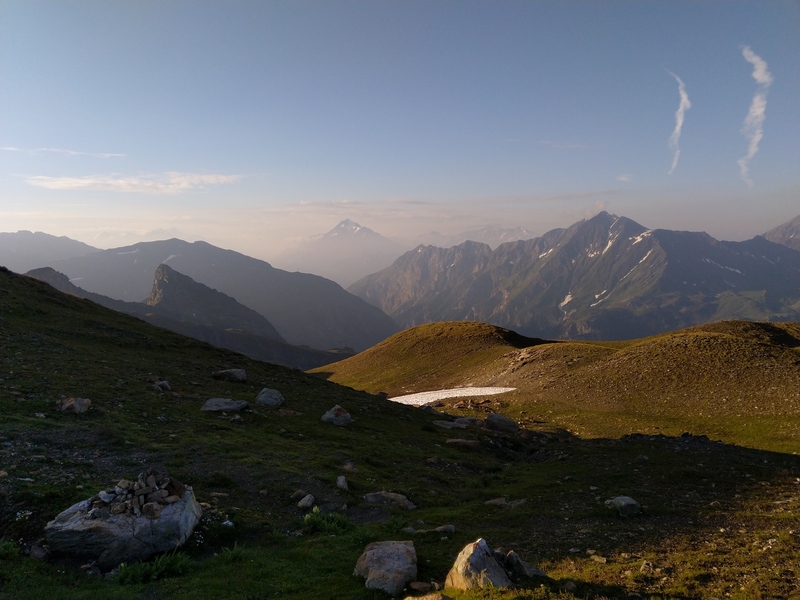 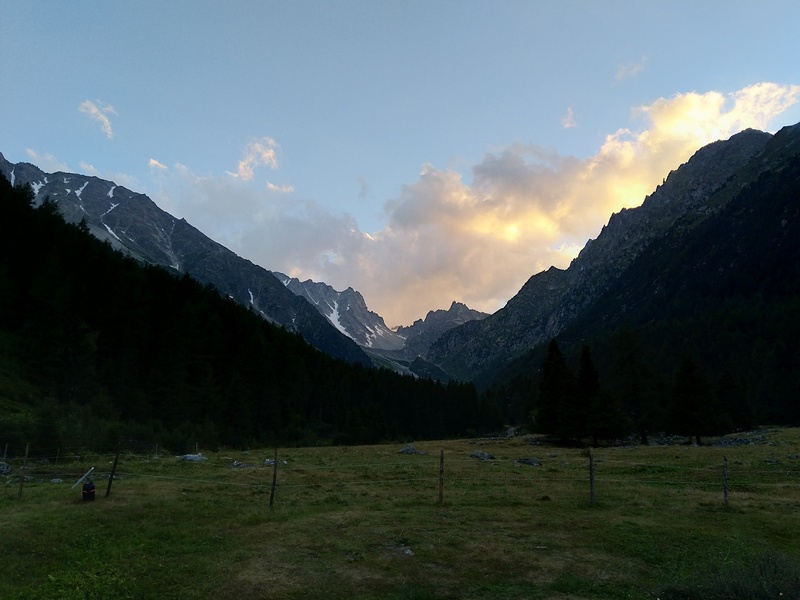 After a short night waking up regularly to assist to the alpinists departure, we went back down to la Cabane d'Orny, but under a beautiful sky. 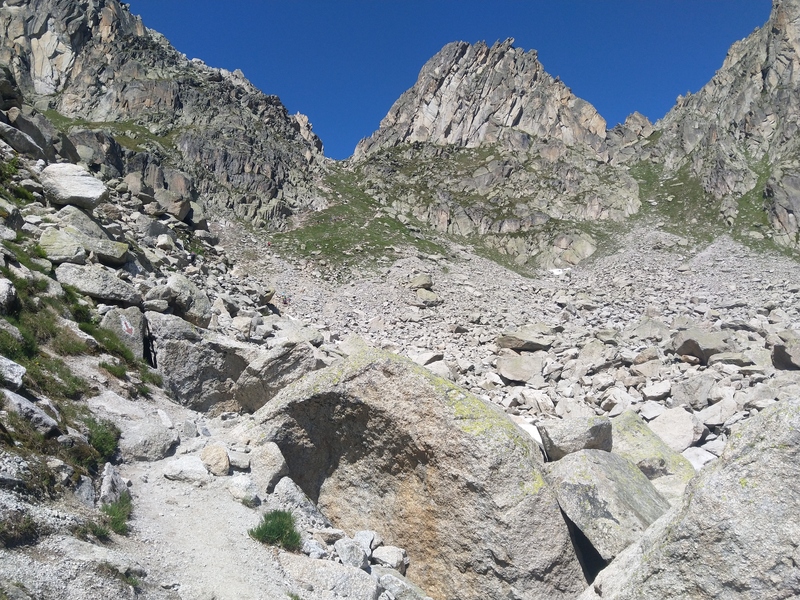 We reached the bottom of La Fenêtre d'Arpette in the evening. 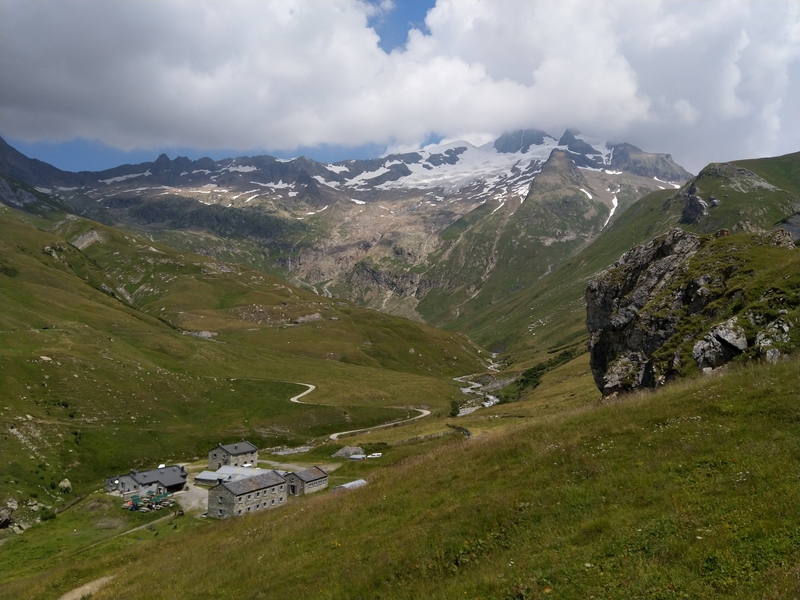 Relais d'Arpette (CH) - Trient (CH). 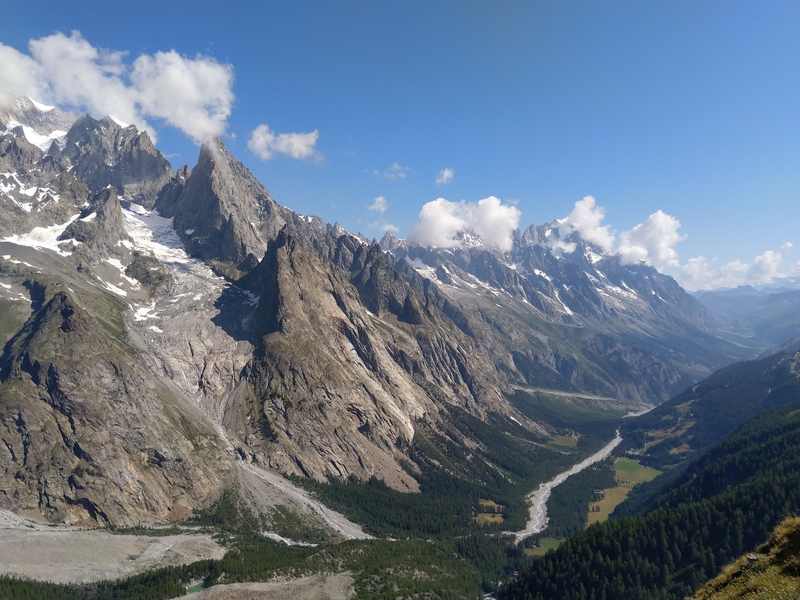 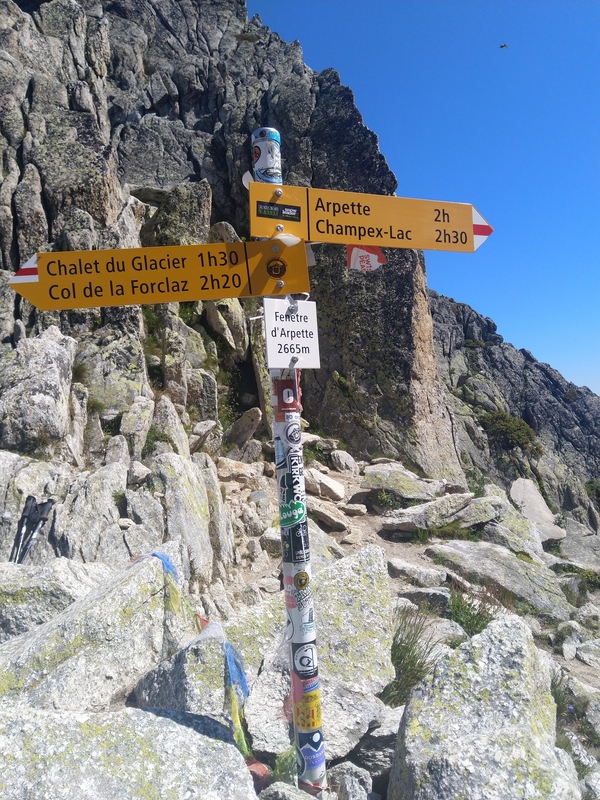 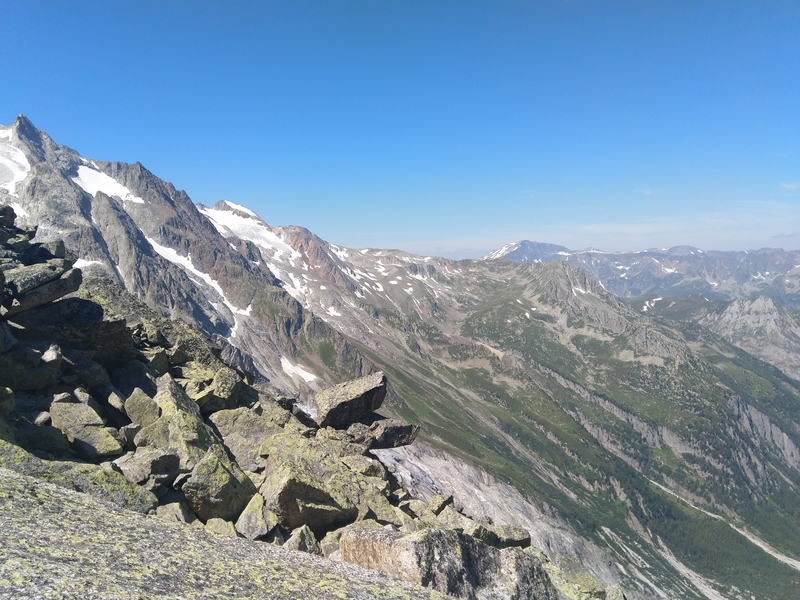 One of the most technical ascent to La fenêtre d'Arpette in order to go around the Plateau du Trient was on this day's agenda. 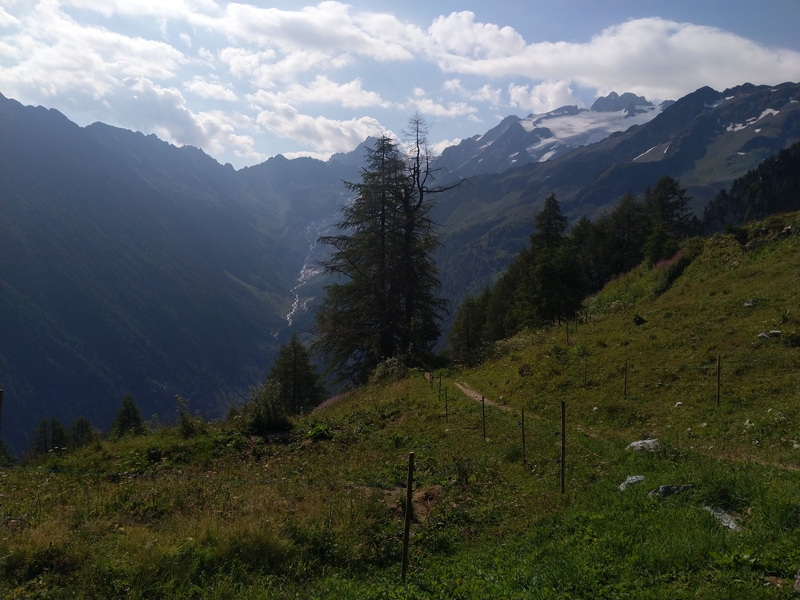 The descent was very steep and difficult too (it caused a fatality a few weeks ago) to reach Trient, a very small village for our last night on the TMB. 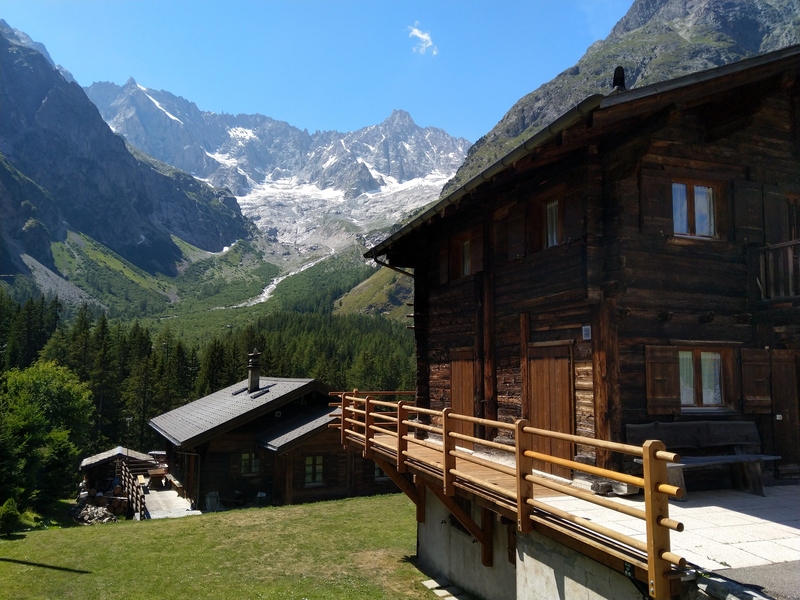 Trient (CH) - Gîte du Moulin (FR). 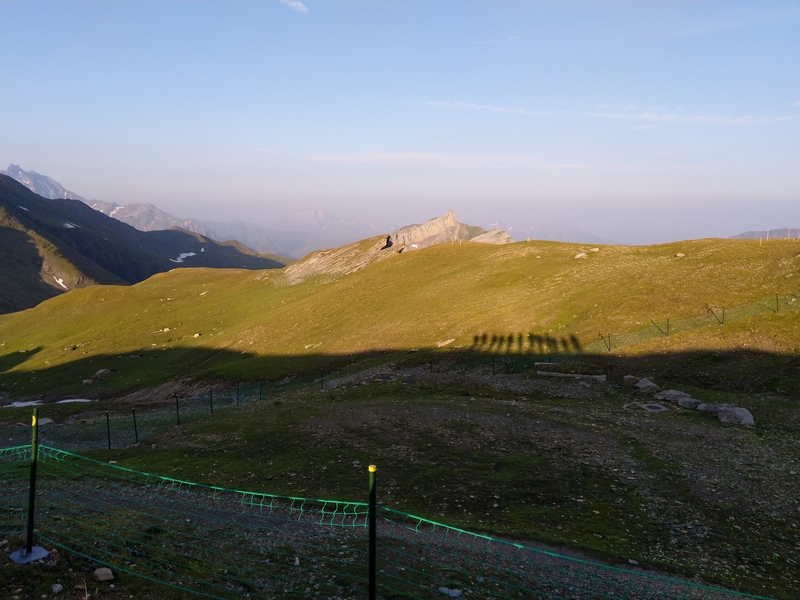 We decided to slightly change our way to avoid seeing too many people on this last day. 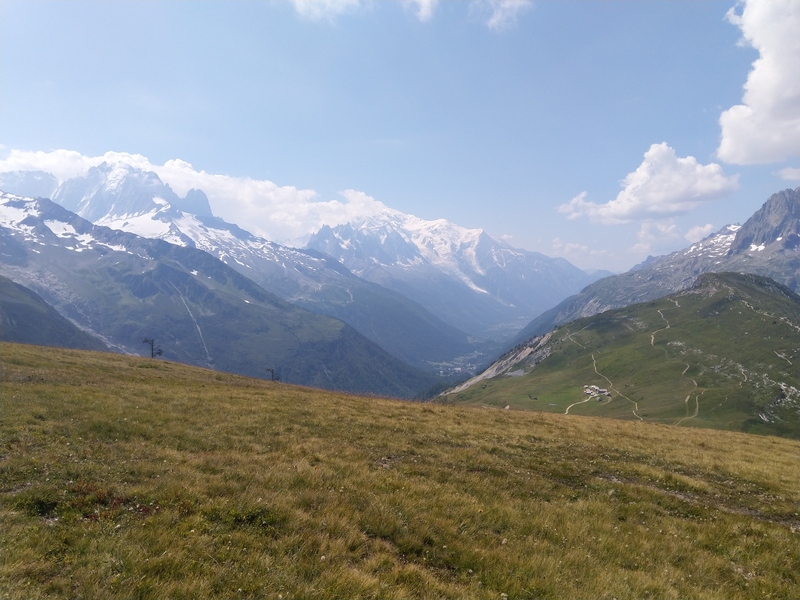 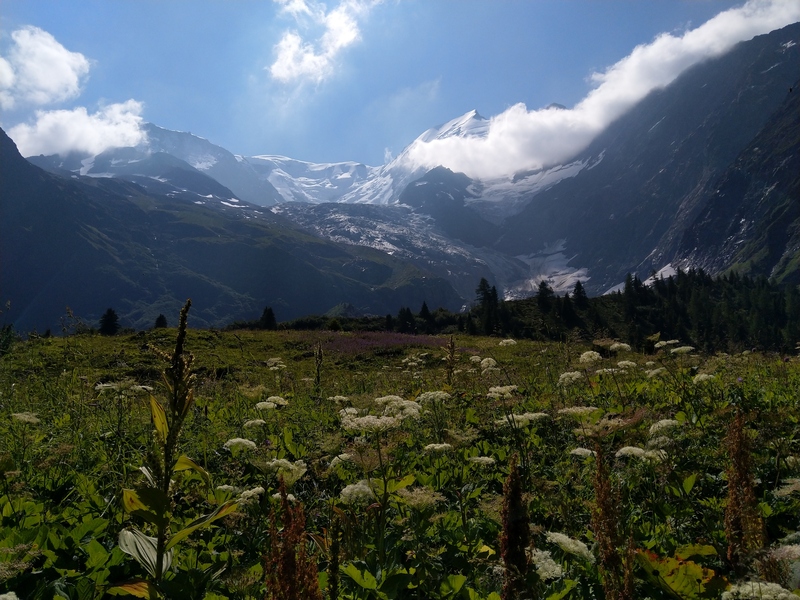 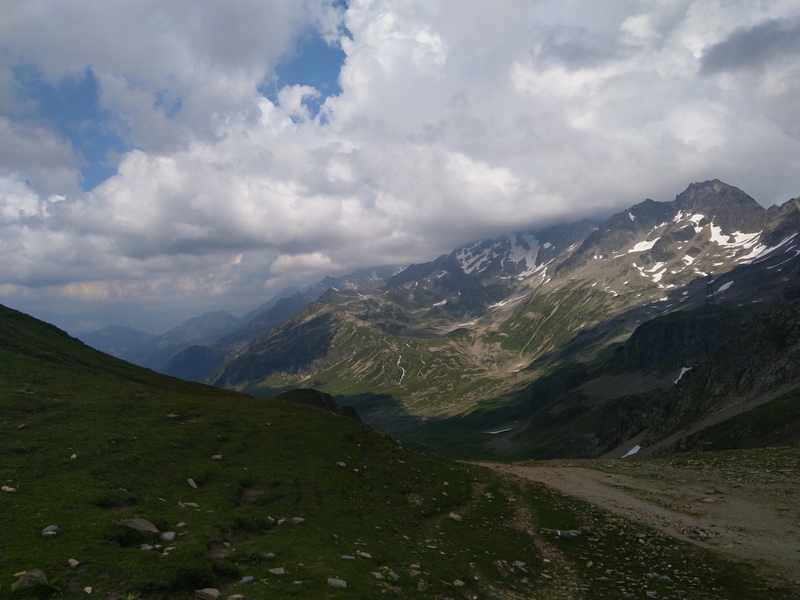 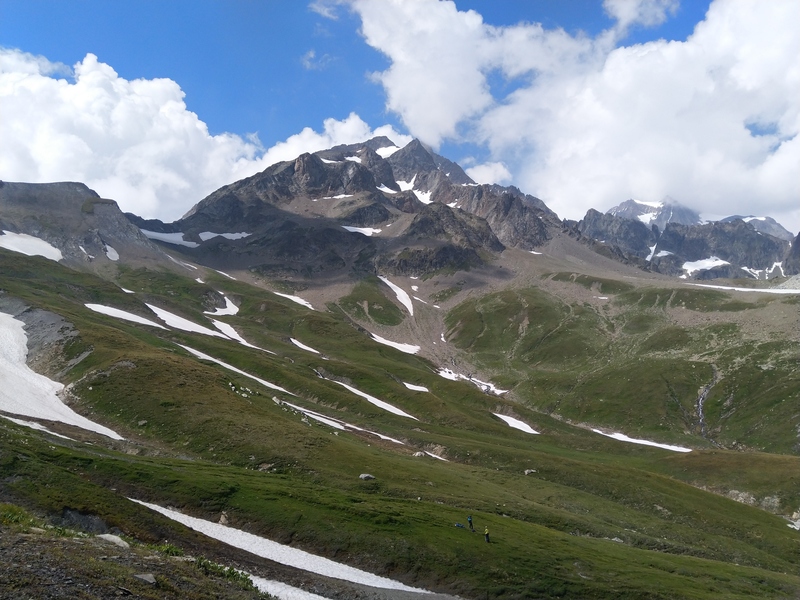 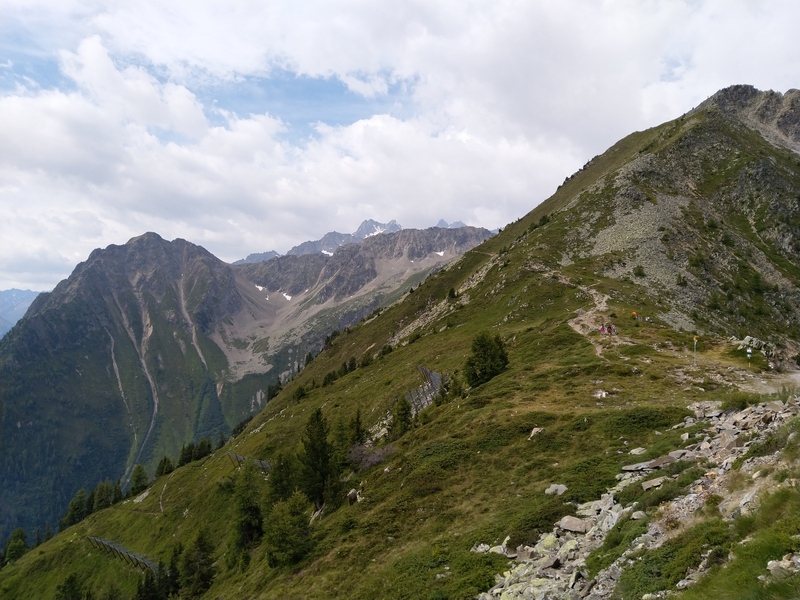 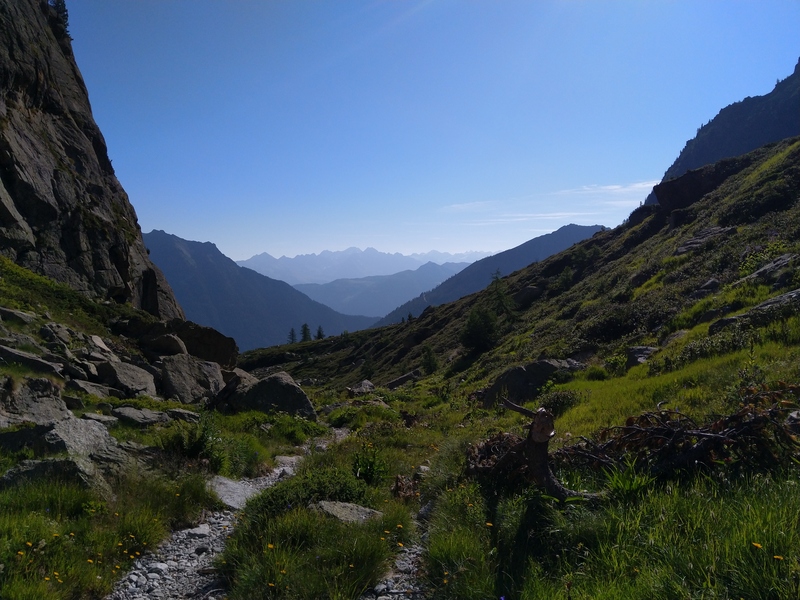 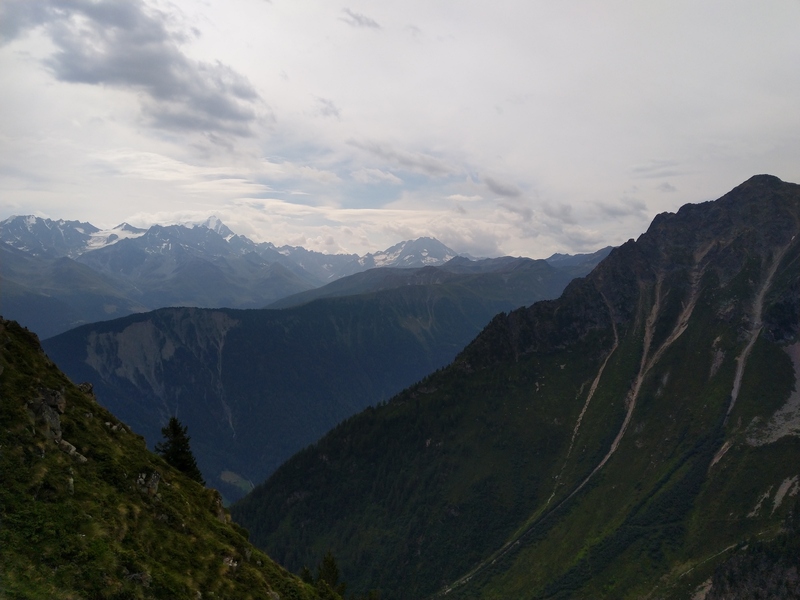 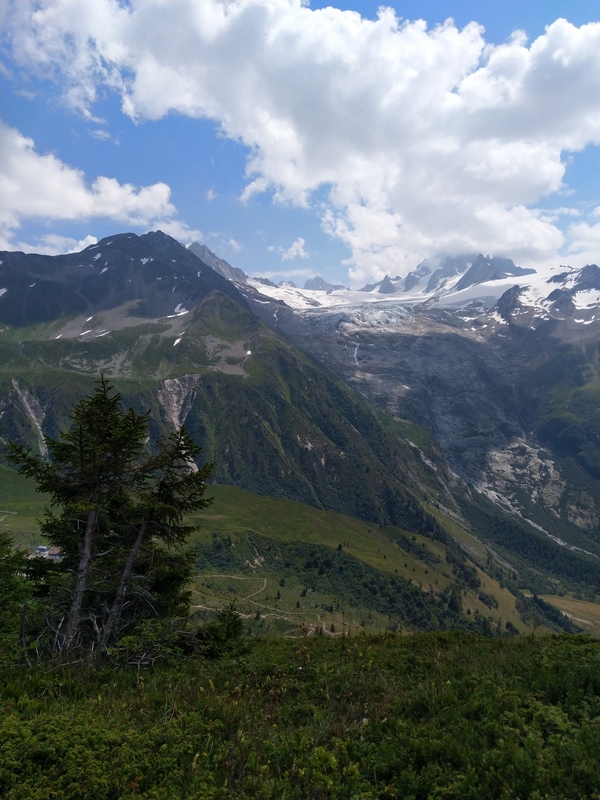 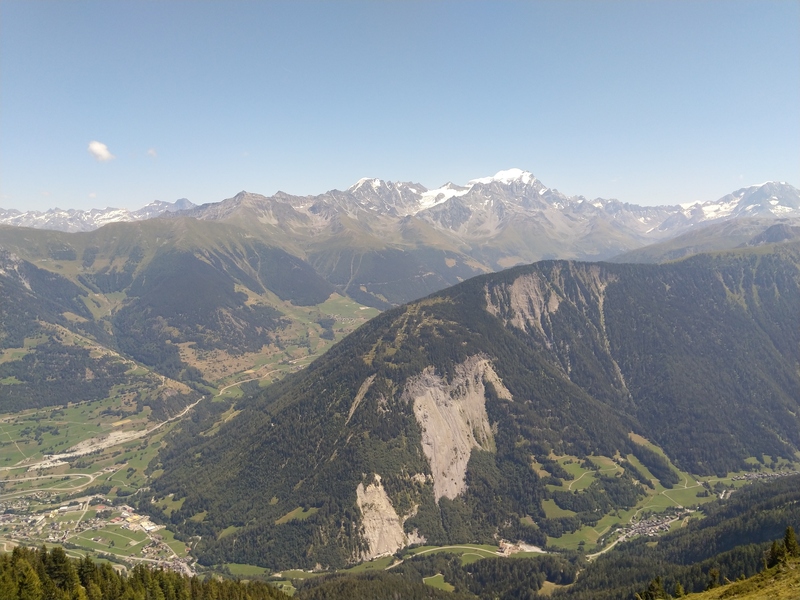 After a steep ascent right from the start, we came behind the Col de Balme, to the Col des Posettes which offers a spelndid view over the Aiguille du Goûter, the Col du Goûter, the two bumps, the Mont Blanc,the Aiguille du Midi, the Aiguilles de Chamonix, the Aiguille Verte and the Aiguille de Chardonnet. 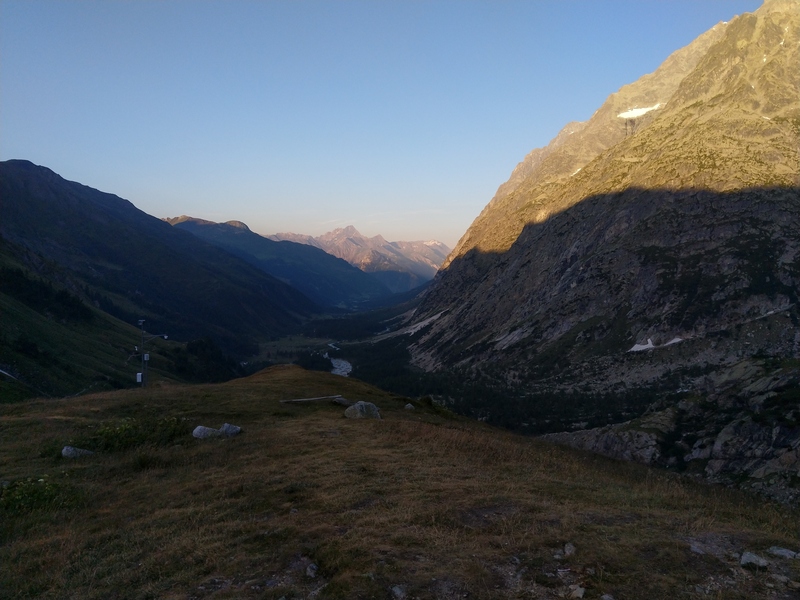 That was a perfect landscape to end our journey! 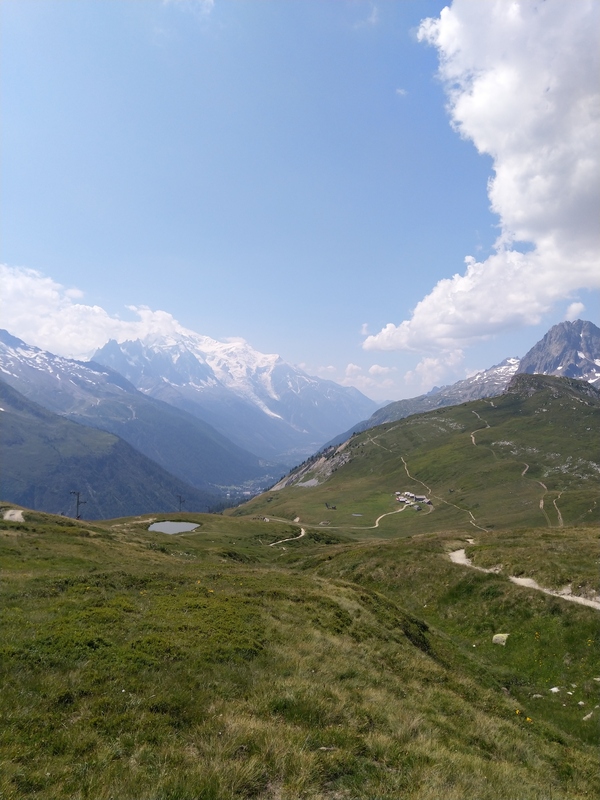 The Tour du Mont Blanc was an awesome experience. 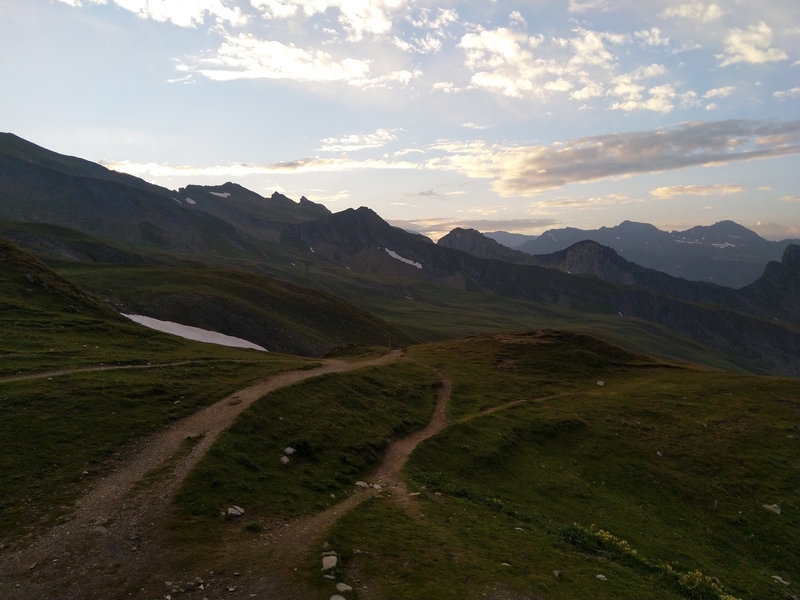 I was afraid to see many people on the same trail but actually there weren't at all. 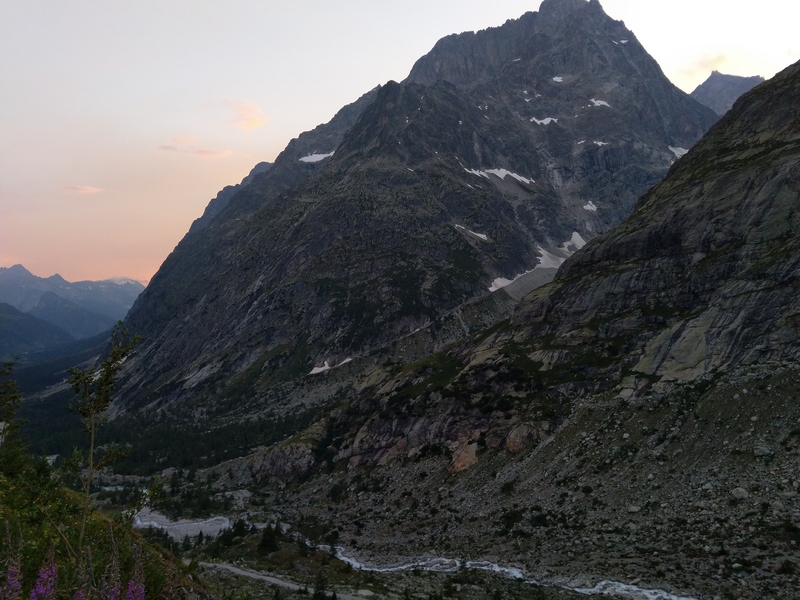 My best moment was probably the night to the refuge du Trient which was absolutely breathtaking - I'll definitively go back there someday.